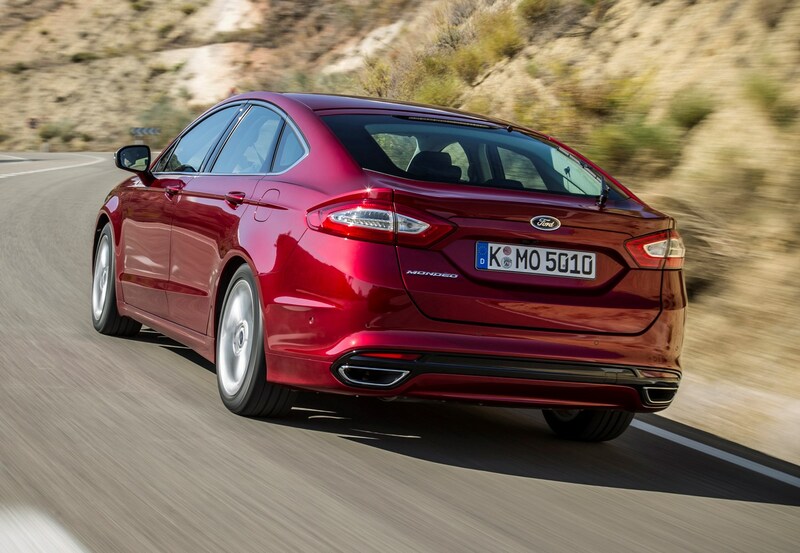 Which Ford Mondeo Hatchback is best for me? 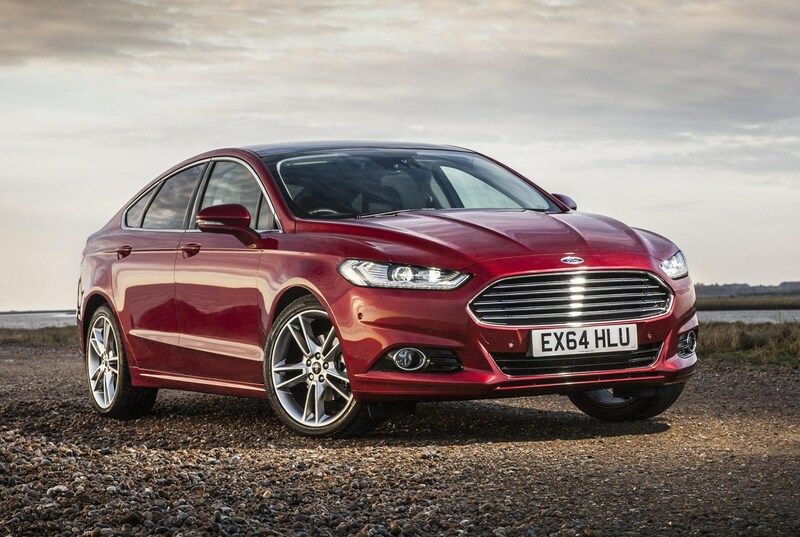 Picking the right Mondeo shouldn’t be too difficult a task, with diesels being your best bet overall. 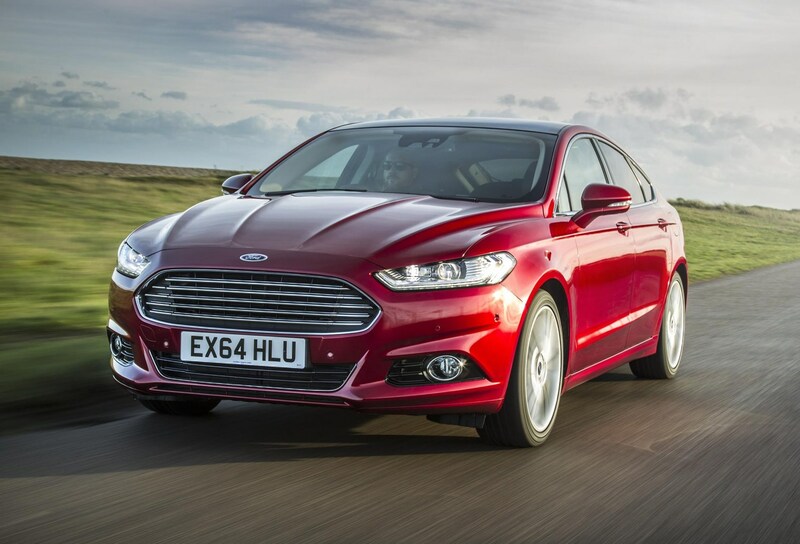 If you simply want the cheapest Mondeo to run, the 1.5-litre TDCi’s running costs are the most appealing, with the highest fuel economy and lowest CO2 in the range. 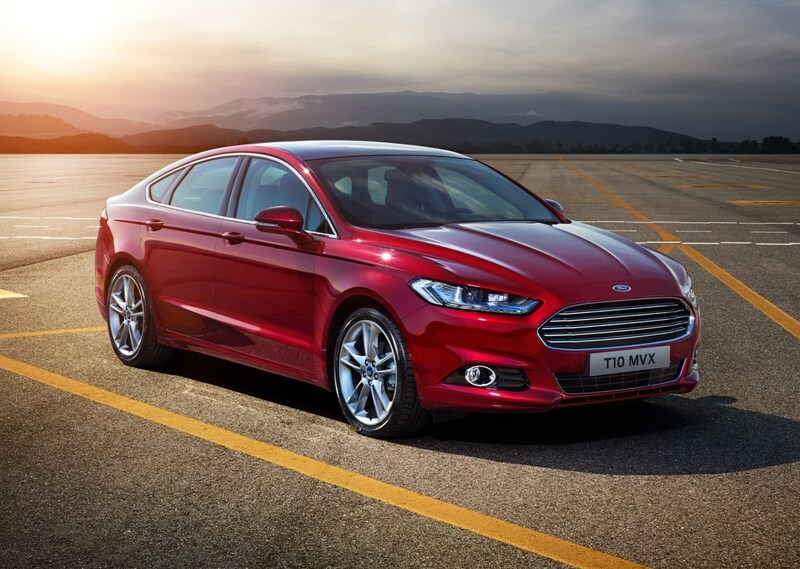 This also means this version is a wise bet if you’re a company car driver as this offers low BIK costs and strong claimed fuel economy. 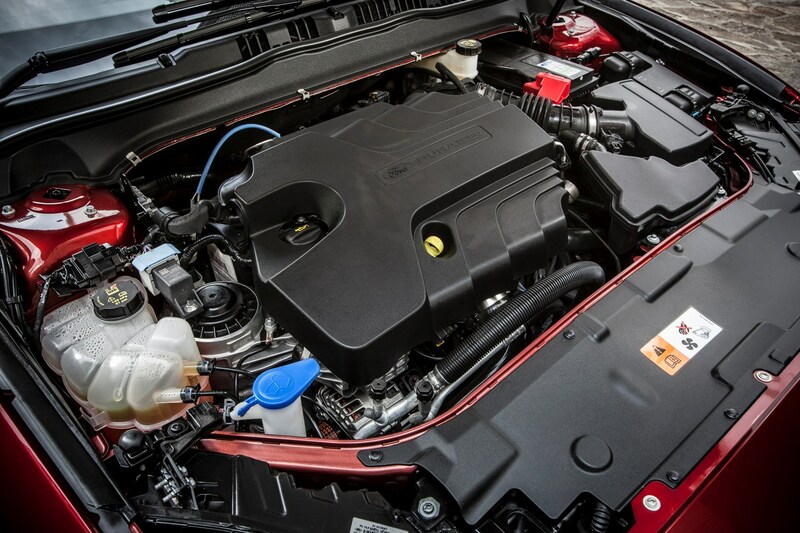 If you want the lowest BIK costs, though, surprisingly the 1.0-litre petrol is the best bet, as its lower list price outweighs its slightly higher emissions than the 1.5-litre diesel. 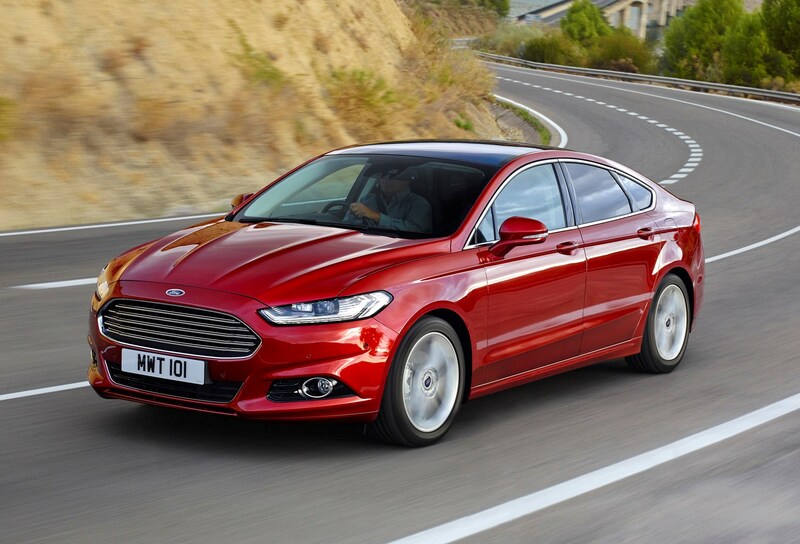 Therefore, if you’re simply after the lowest BIK bills it’s worth considering the petrol, though if you cover high mileages the diesel’s greater fuel economy is likely to save those who pay for their own fuel even more. 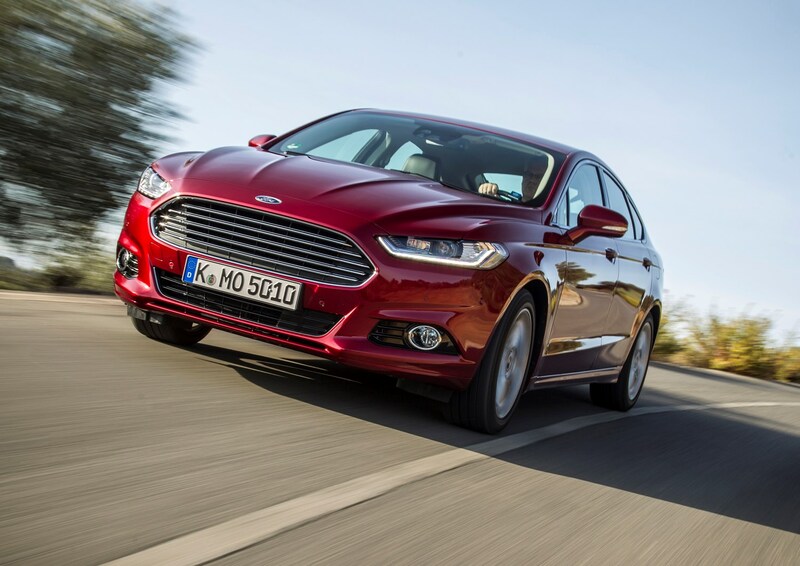 If you want a quick Mondeo, the 2.0-litre EcoBoost with 240hp is the fastest on paper, but the extra torque offered by the 210hp 2.0 TDCi means this could feel quicker on the road, especially when you’re overtaking on the motorway, for example. 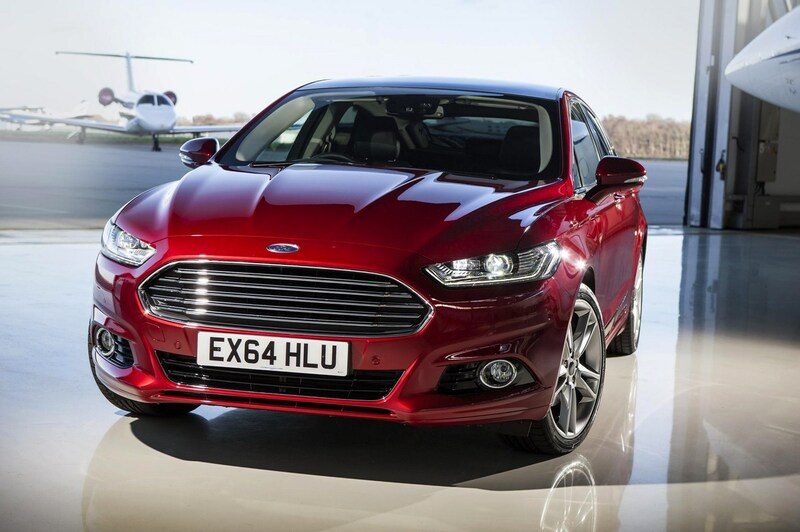 Sitting near the top of the Mondeo range (at least on the sportier side of things) is this ST-Line Edition model, boasting a lengthy list of standard equipment, a muscular body kit and the most powerful diesel engine available – the 2.0-litre TDCi diesel with 210hp and a PowerShift automatic gearbox. 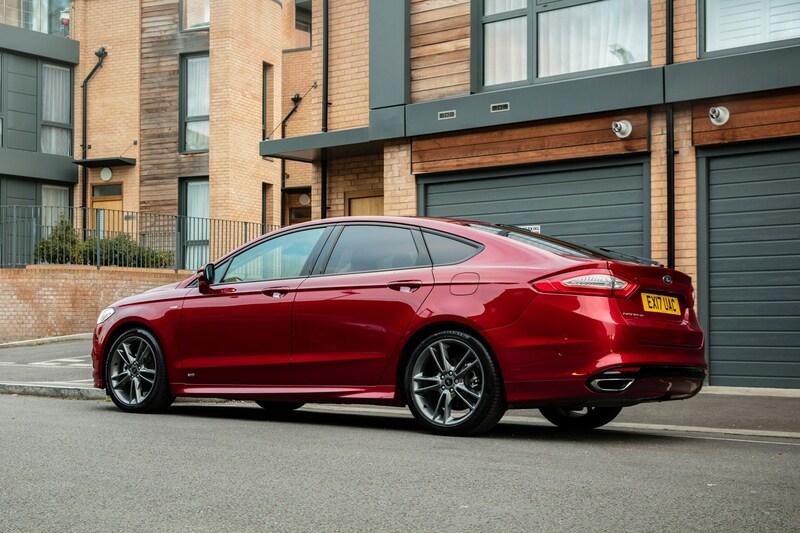 The ST-Line Edition spec certainly looks the part with the standard body kit, larger 19-inch alloy wheels that fill the Mondeo’s large arches better than the standard 18s, as well as privacy glass. 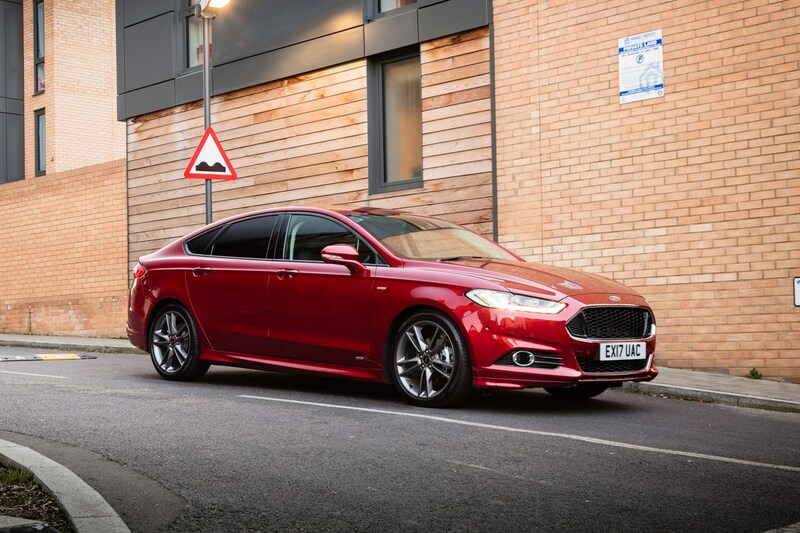 In reality though, you probably don’t need the extras the ‘Edition’ adds over the regular ST-Line, especially as it boasts quite a high list price close to £30,000. 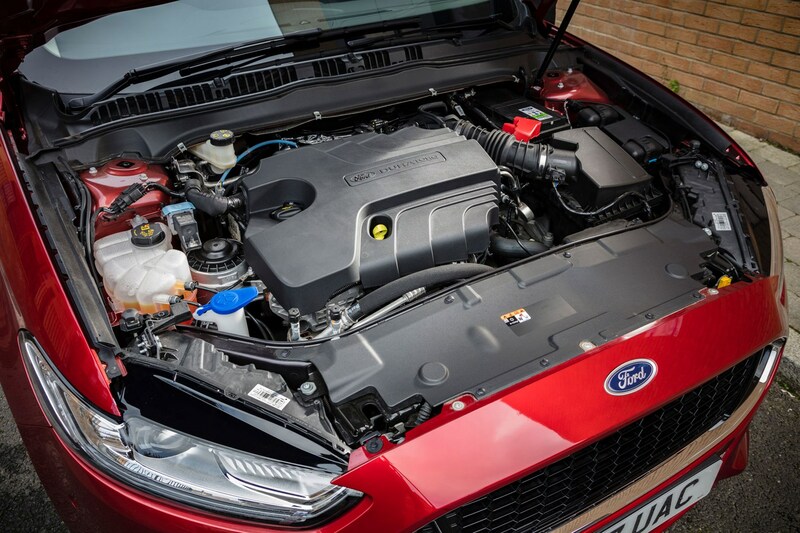 If you must have the ST-Line Edition’s look and gadgets, it’ll be worth considering a less powerful version of the 2.0-litre TDCi diesel engine. 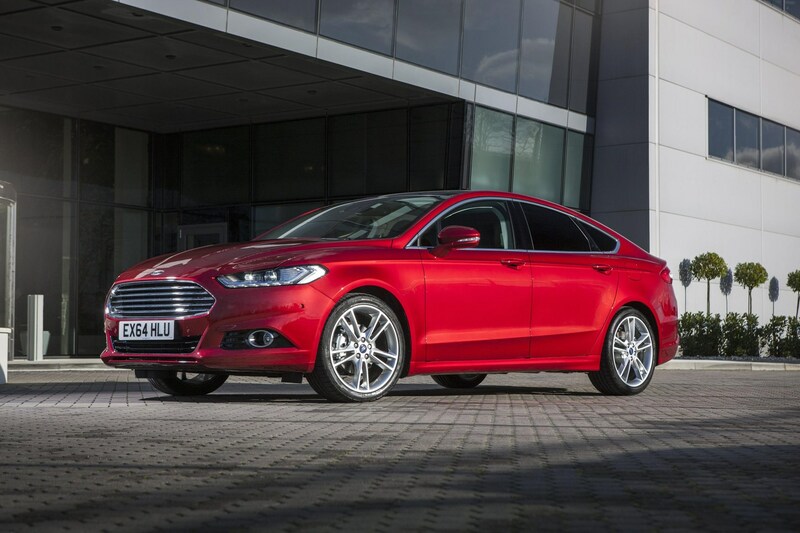 While the 210hp is great for effortless performance via the smooth PowerShift gearbox, the 180hp version manages to haul the Mondeo along with ease anyway, so you could save yourself a bit of cash and opt for this engine instead. 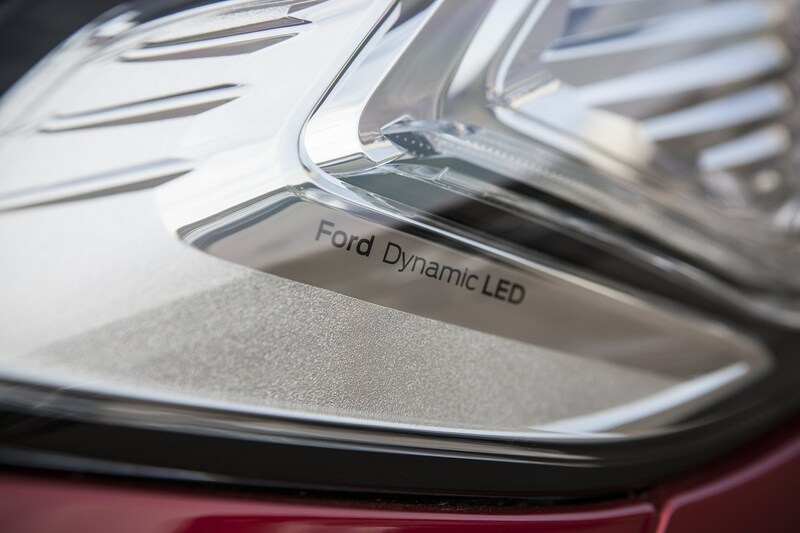 It’ll still be just as smooth and refined as the 210hp model, but with a few benefits in fuel economy and lower CO2 emissions. 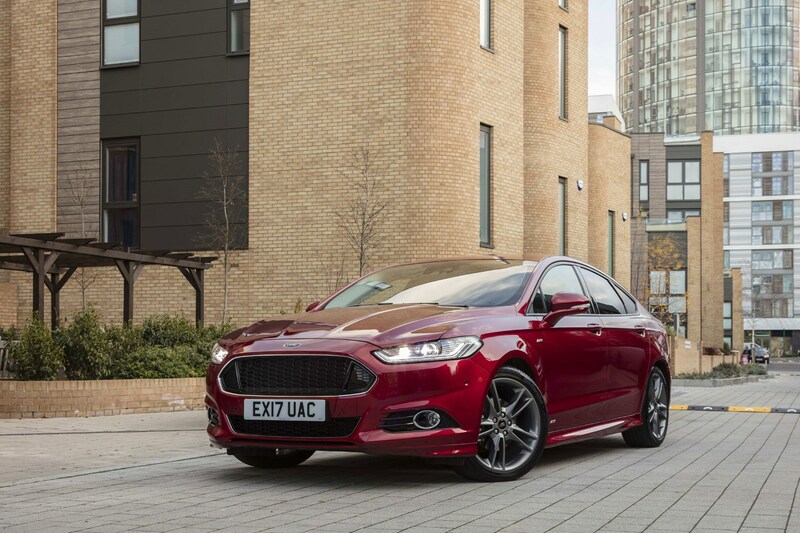 The Mondeo’s performance in a straight line is matched with tidy handling when it comes to a corner, but if you want a Mondeo that handles like a Fiesta (like old models used to), you may be disappointed that Ford’s biggest hatchback is more focused on comfort and refinement than driving thrills. 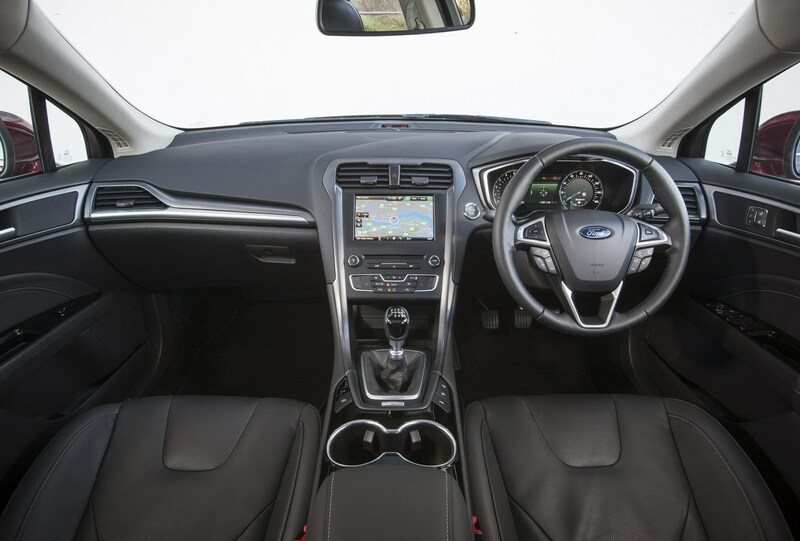 The ride is very good indeed – even on sports suspension with 19-inch alloys, and refinement at all speeds is very impressive. 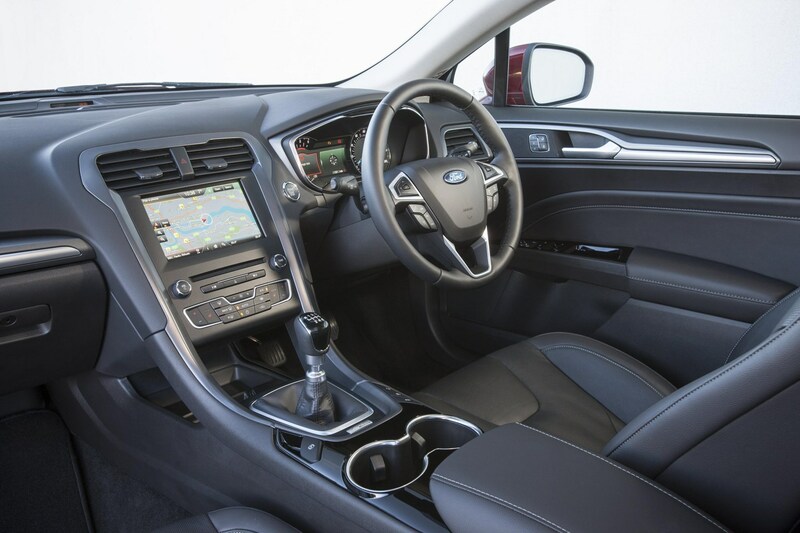 The excellent seats in this high-spec model help with this, with very good support and an equally high degree of comfort, making long journeys in the Mondeo an absolute breeze. 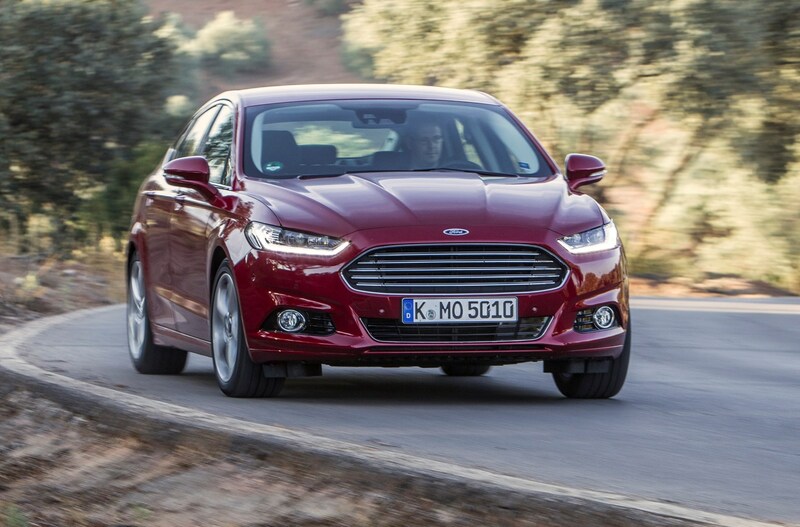 This isn’t to say the Mondeo is disappointing on a country road, as the steering is sharp and responsive and it holds its own against smaller hatchbacks. It disguises its enormity very well indeed. 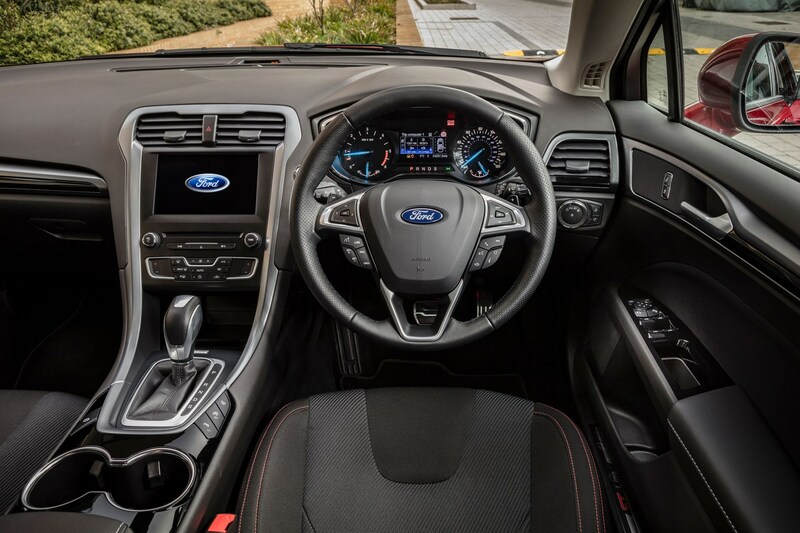 Head to the Equipment section for full spec details of the ST-Line Edition and you’ll see it comes loaded with kit to keep you and passengers comfortable and occupied on a long journey. 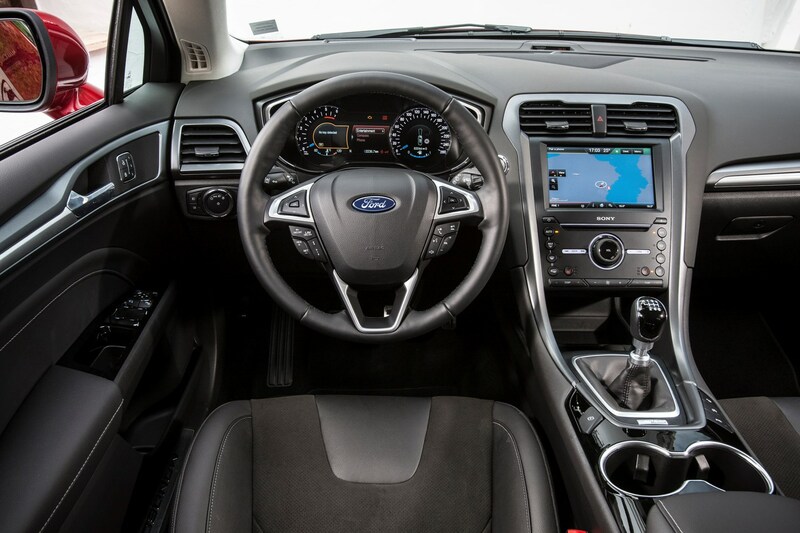 The interior also impresses with lots of space, both front and back. 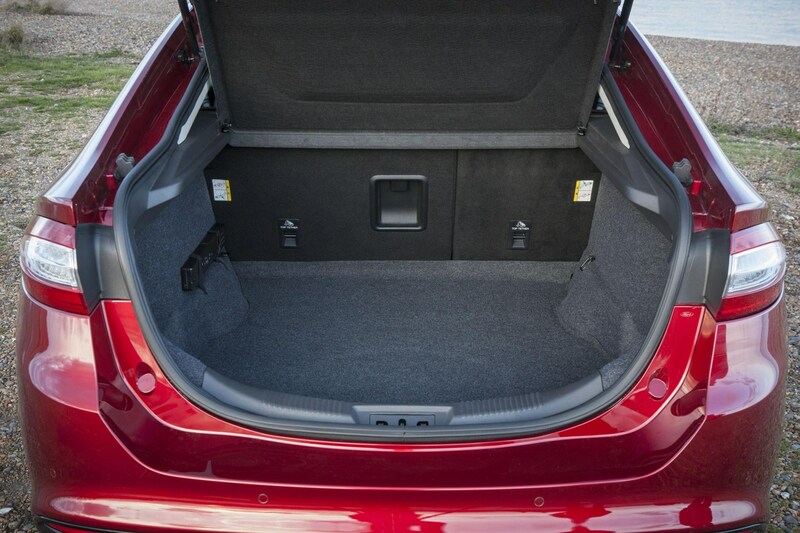 Only taller passengers in the back may complain about restricted headroom thanks to the car’s sloping roofline, while this sportier model also comes with black headlining which could make it feel a little tighter in the back. 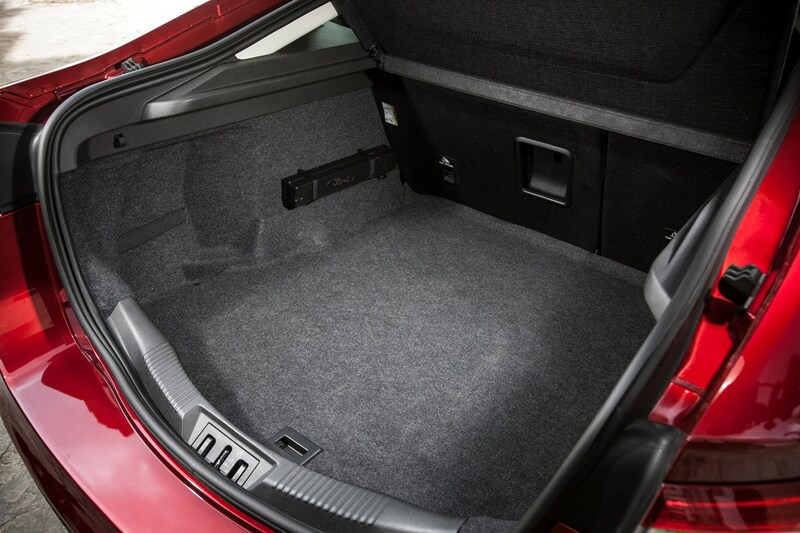 There won’t be any complaints about legroom though, and the vast boot is easily accessed via an enormous tailgate, although the overall capacity can’t match that of the VW Passat or Skoda Superb. 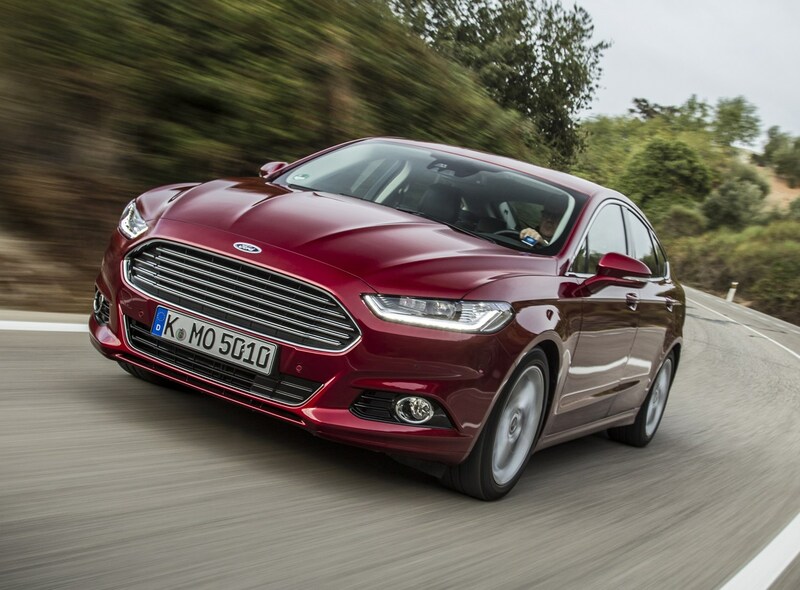 The Mondeo in ST-Line Edition spec is an appealing car, with good looks and a high-quality, well-equipped cabin, but we don’t think you need to spend the extra cash on the 210hp diesel engine. 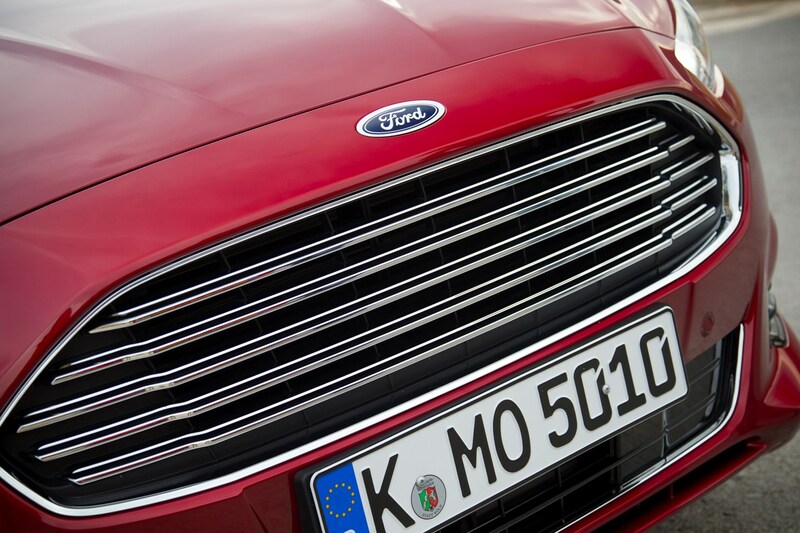 The 180hp version will do just fine, and costs a good amount less to buy in the first place. 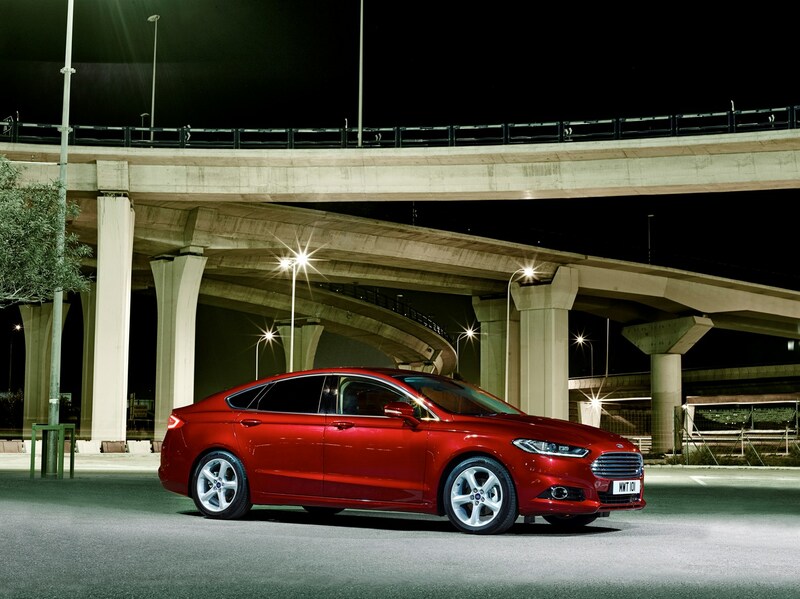 And if you can live without the luxuries, a regular ST-Line has most of the look at a lower price, too. Size matters, doesn’t it? 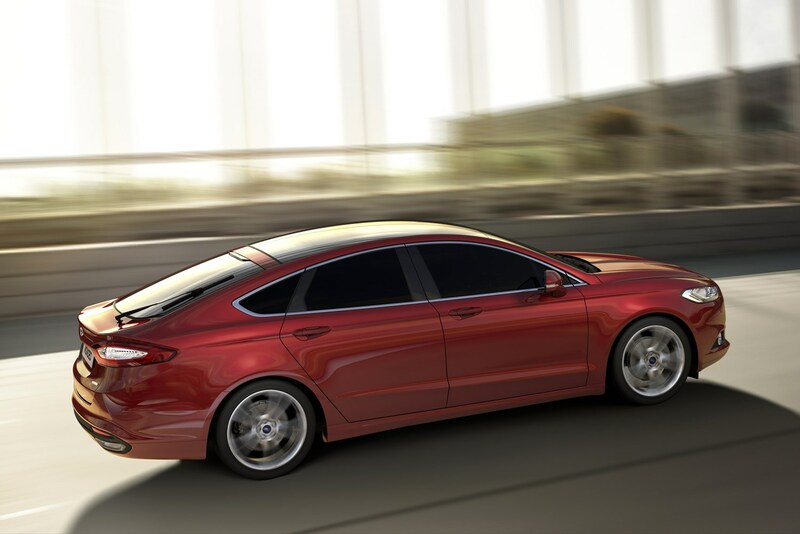 After all, there’s a reason why the Ford Mondeo measures 4,871mm from nose to tail, that length providing ample space for passengers and their luggage. So it’s a fair assumption that a large car necessitates the fitment of a large engine – except this one’s got quite the opposite. 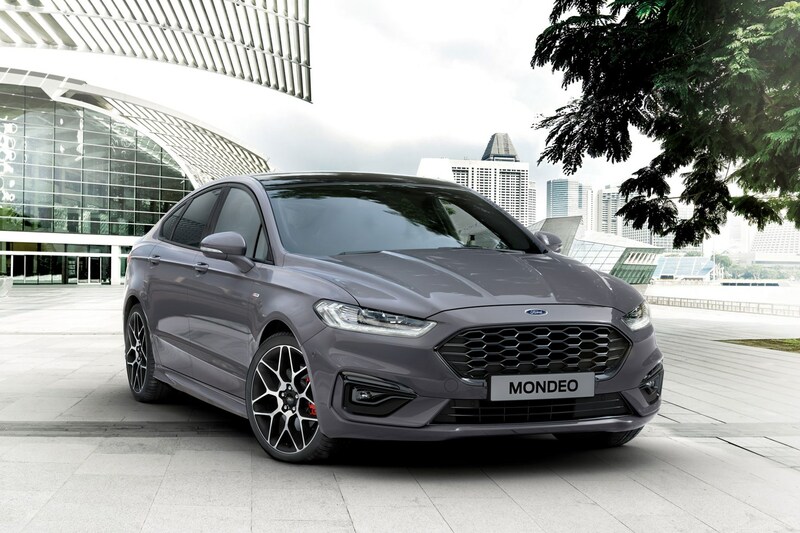 Pop the bonnet of this Zetec-trimmed Mondeo and you’ll find the same turbocharged 1.0-litre engine that also powers the much smaller Fiesta and Focus. 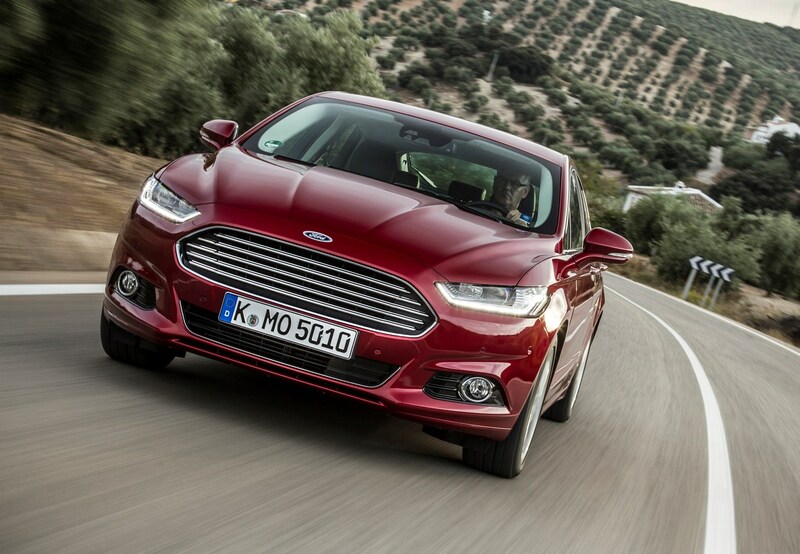 Is the 125hp it musters enough to haul along the Mondeo’s heft? 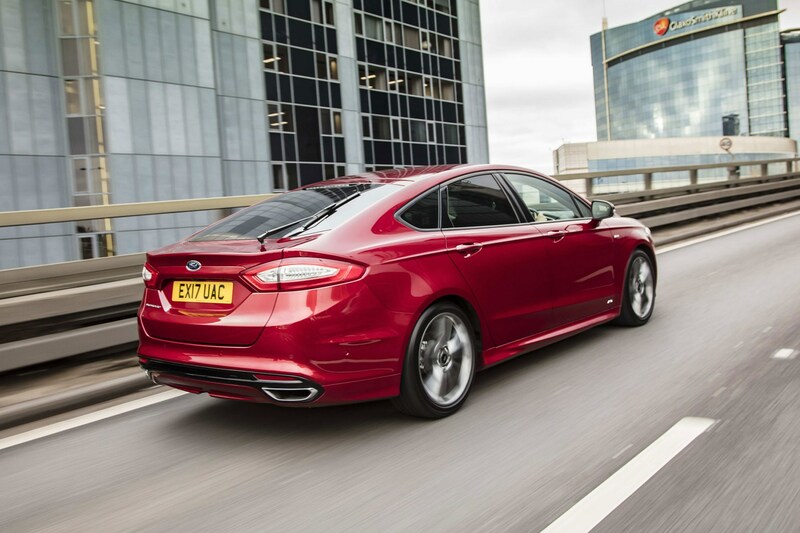 Prod the 1.0-litre Mondeo’s accelerator and two things become immediately apparent: that familiar three-cylinder thrum from the motor is still there – although its aural qualities are subdued by the big Ford’s superior sound deadening – and performance is adequate rather than sparkling. 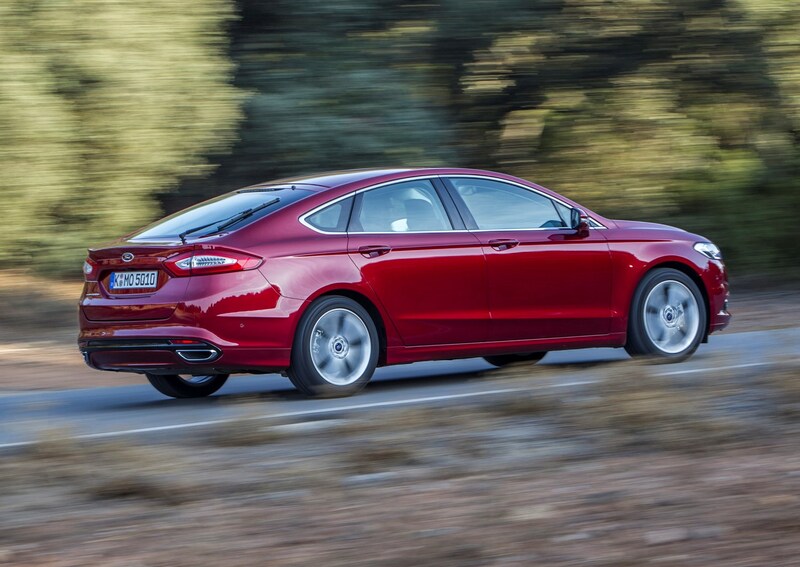 Under gentle driving conditions, the 1.0-litre Mondeo performs perfectly acceptably, soon up to 30mph aided by slick shifting between the lower ratios of the standard six-speed manual gearbox. 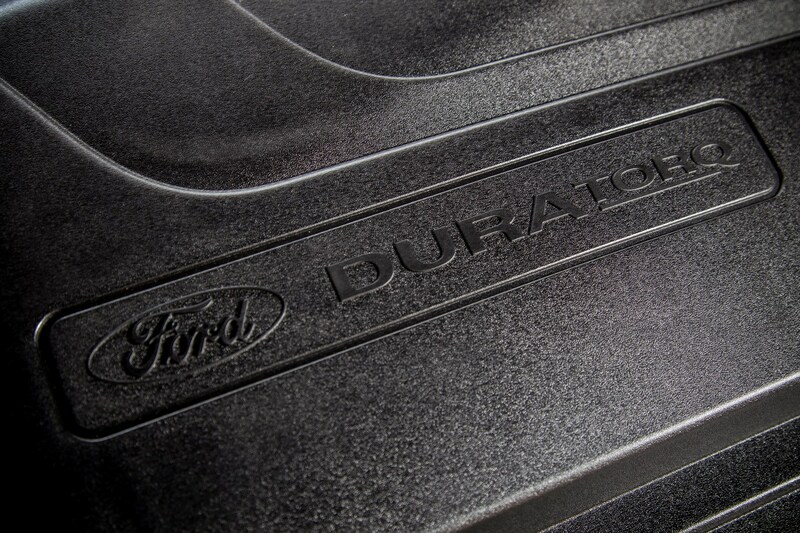 And that peak torque is available from a low engine speed of just 1,400rpm. 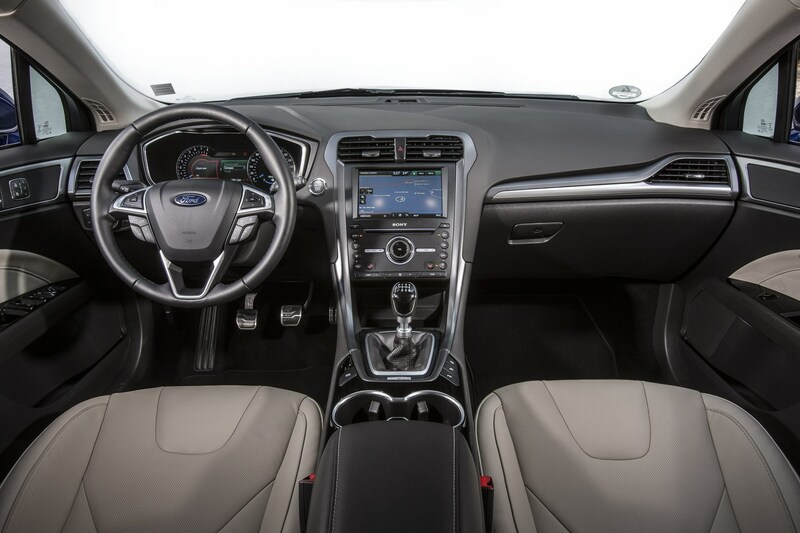 You’ll get used to making frequent gear changes to extract the most of the EcoBoost’s potential at higher speeds, though. Despite the torque being available from low engine speeds, it peaks at just 170Nm, noticeably running out of steam as the revs rise. 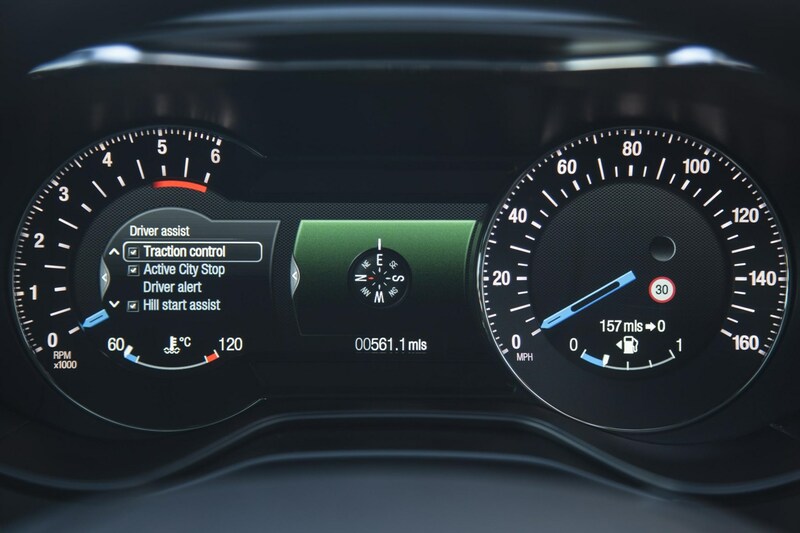 Get used to dropping a couple of gears for completing overtaking moves with greater confidence. 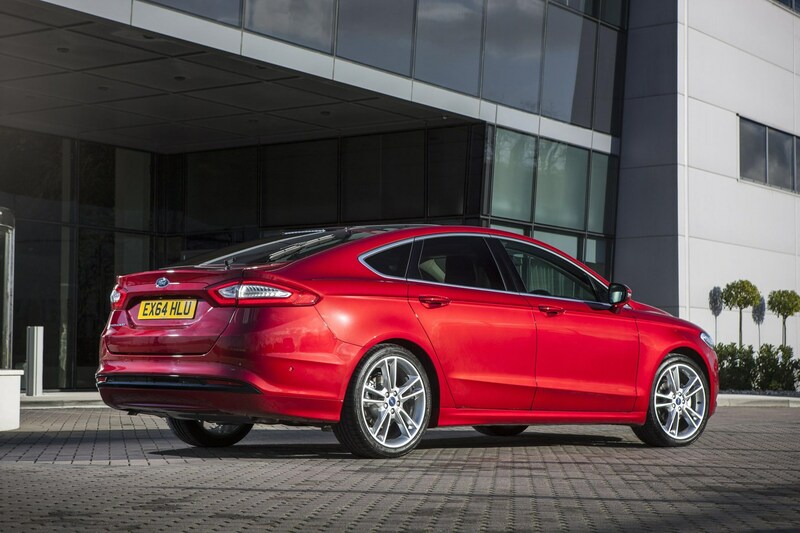 Reinforcing the leisurely delivery is a 0-62mph acceleration time of 12.0 seconds, the slowest of the current crop of Mondeo hatchbacks. 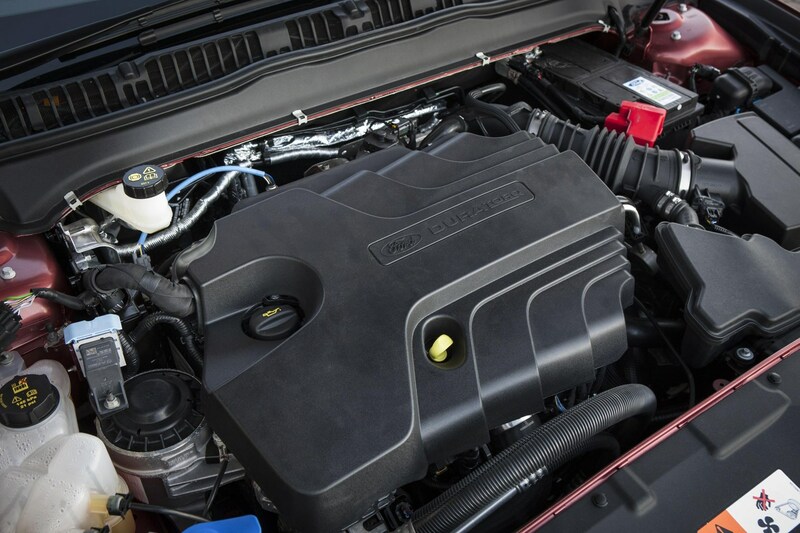 Diesel economy from a petrol? 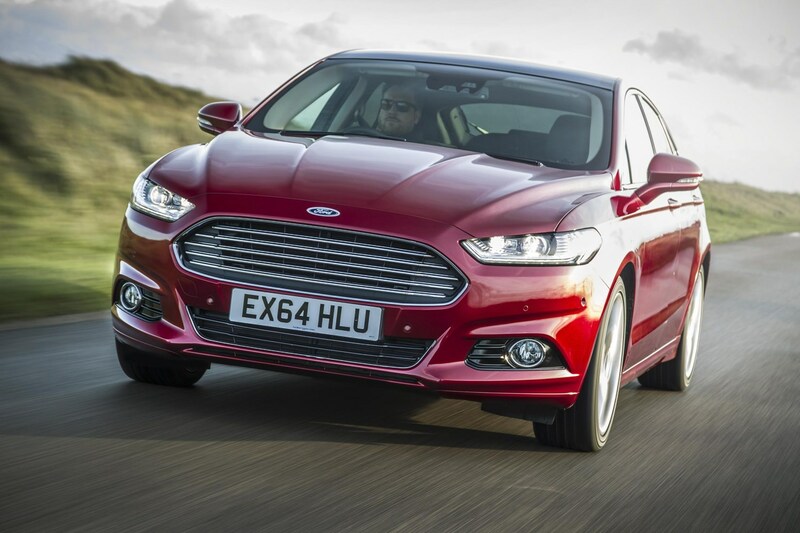 The smaller EcoBoost’s remit in the Mondeo is to be an economical petrol alternative to the 1.5-litre TDCi diesel rather than delivering the sort of punchy experience familiar from the Fiesta. 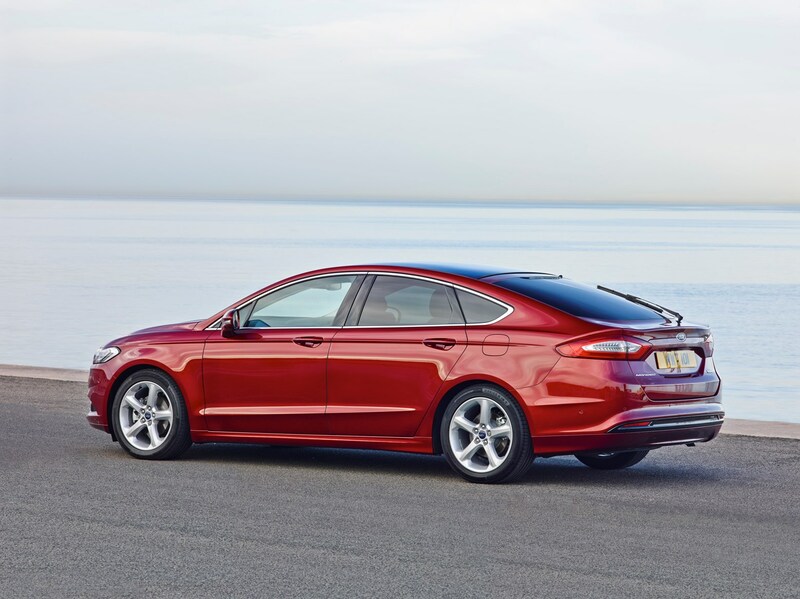 Not everyone covers the kind of high mileages diesels require for them to make financial sense, so frugal-minded private motorists who tend to favour shorter trips are Ford’s target. So economy must be fabulous, right? 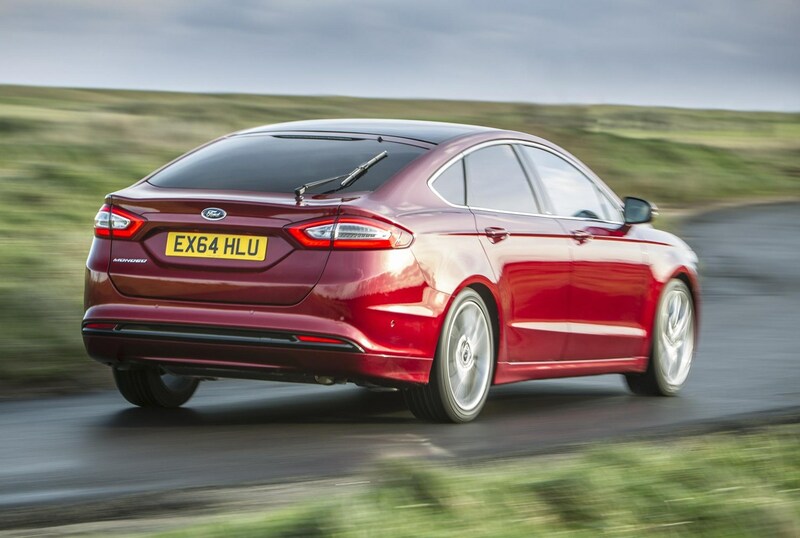 Officially Ford claims an average 55.4mpg but our test, comprising stop/start urban driving as well as a pacier sprint in the countryside realised an indicated figure of 36mpg. 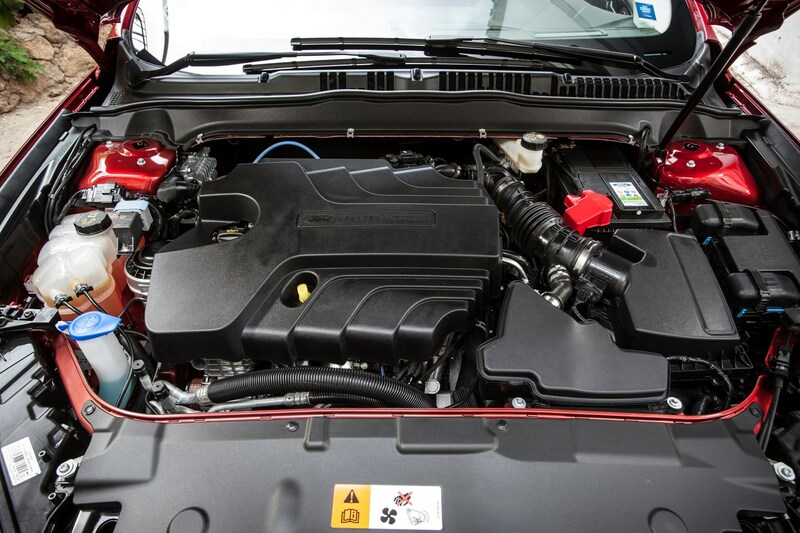 The 1.5-litre diesel alternative should manage high-40mpgs without even trying. 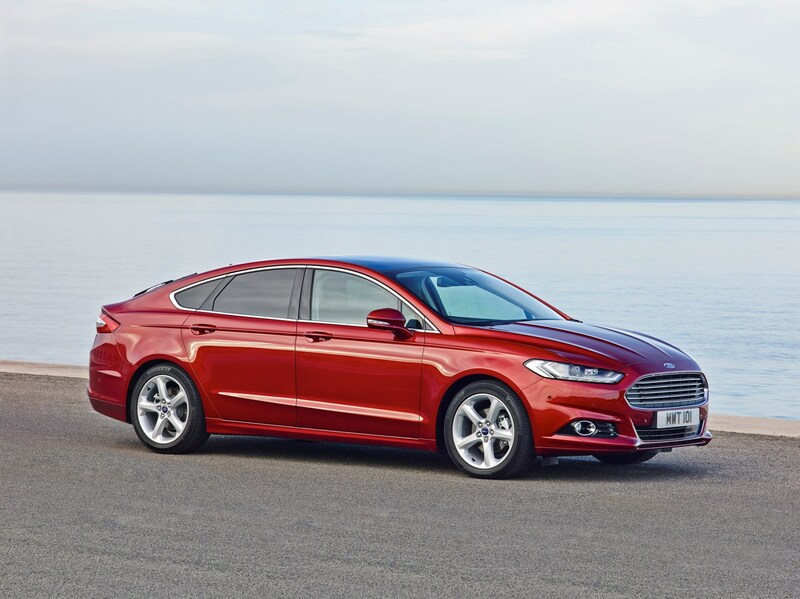 There’s no escaping that the 1.5-litre diesel Mondeo offers superior fuel efficiency and lower CO2 emissions than its 1.0-litre petrol counterpart, but the fuel itself is more expensive and the car costs £2,100 more to buy in the first place. That’s going to require a significant racking up of miles before the diesel’s extra cost is recouped. 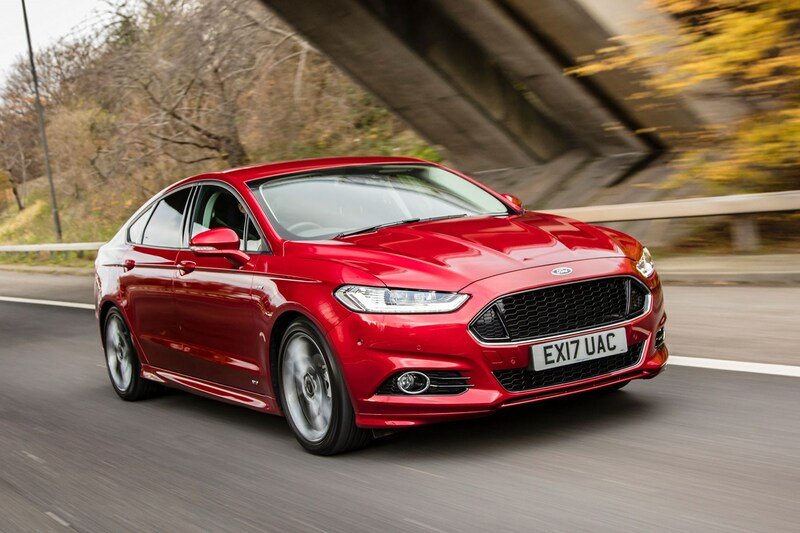 For those who tend to cover shorter distances, where diesel efficiency is less of a factor, then this latest 1.0-litre petrol Ford Mondeo EcoBoost becomes a viable alternative. 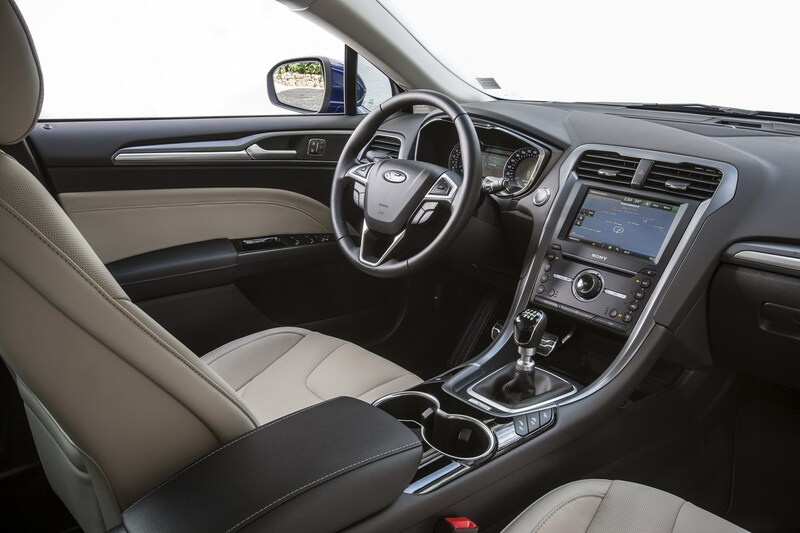 Don’t expect performance to scintillate – instead revel in its ease of driving for a more rewarding experience, proving it’s not how big it is that’s important, it’s how you use it. 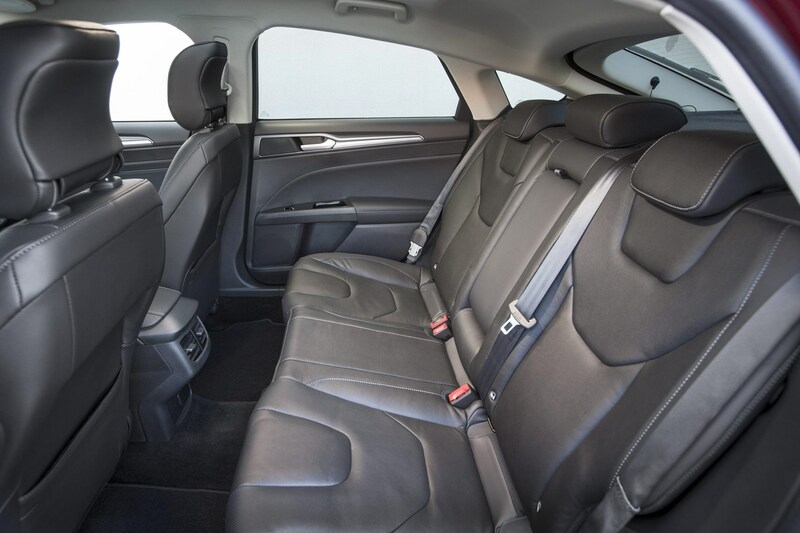 When buying a new family car, high specification trim levels rarely make sense. 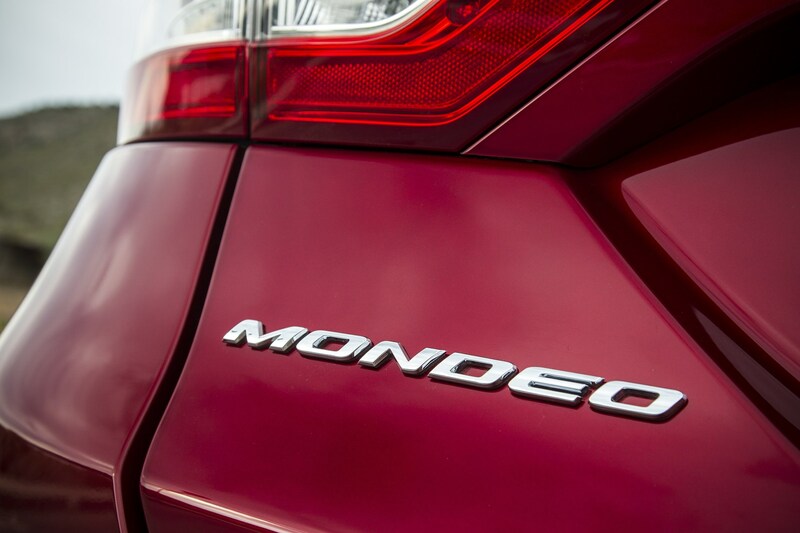 Whether their rumps are badged Ghia X, GLE or Diplomat, more often or not it’s the Zetec, GL or LS models that harbour the most sensible appeal. 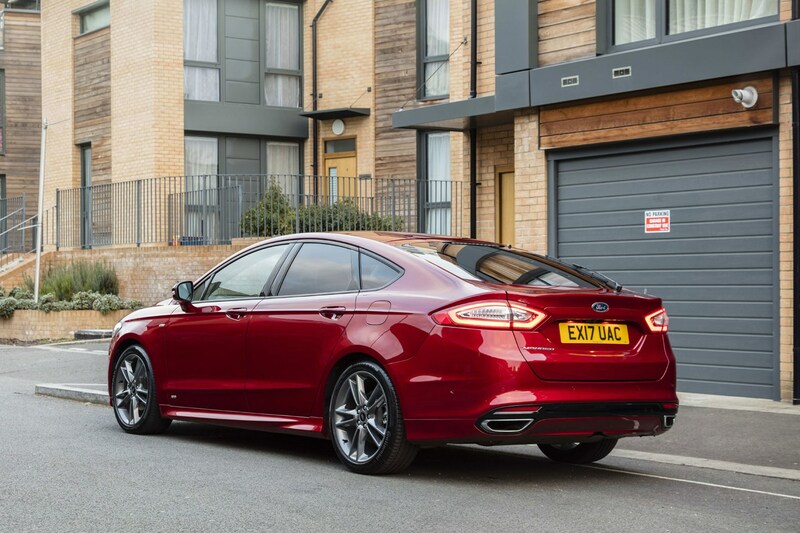 And so it is with the new Ford Mondeo, a car that looks temptingly appealing in range-topping trims, but sits in the sweetspot of the line up a little closer to the entry point of the range. 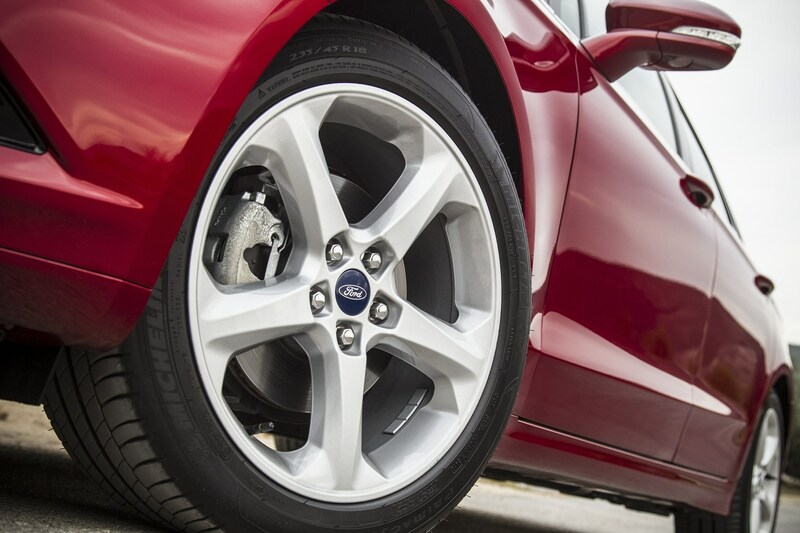 But my word, does it look under-wheeled, the 16-inch wheels of our test car seemingly lost within the oversized arches of this global (read developed in land of the large, America) model. It’s not helped by the huge high-profile tyres, though the flipside of this over-endowed rubber reveals itself in a comfortable ride. 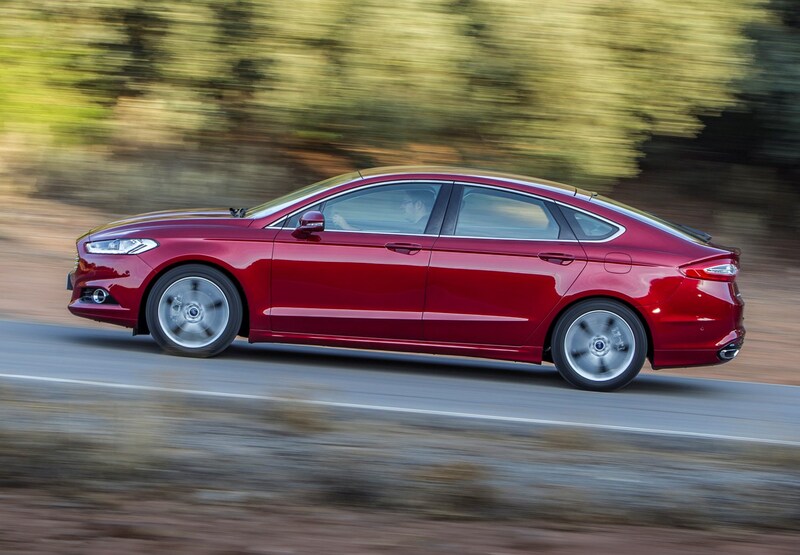 And while the Mondeo Zetec may not look the sharpest in the family car pack – that accolade could be awarded to the sleek VW Passat – it manages to stand out in other ways. For a start it’s big. Really big. And you’ll notice that as soon as you pop open a door, with a vast cabin and comfortable seats waiting to greet you. It’s really rather dull in there though, a sea of black and grey plastic and fabrics only slightly lifted by fillets of silver trim and ice blue instrument needles. 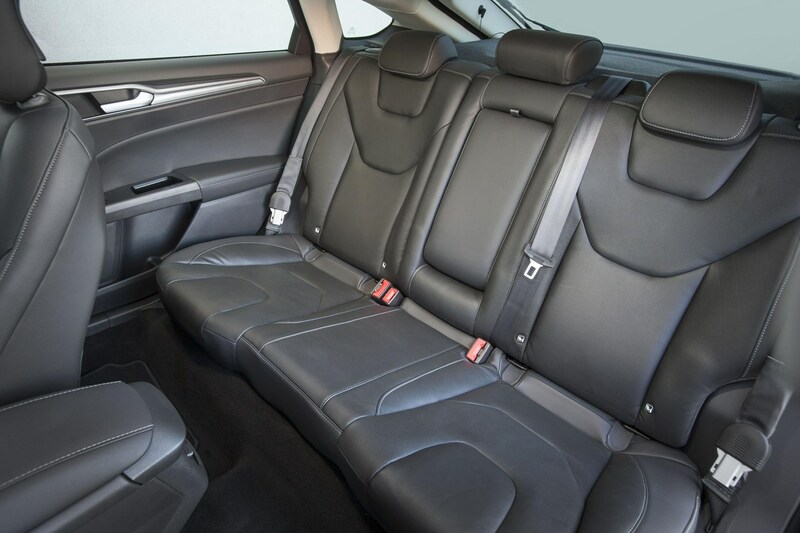 The wide centre console, which runs down into an equally wide transmission tunnel, adds to its gargantuan impression – and though the dash is neatly constructed with tight panel gaps and a clear layout it falls behind the Passat for quality and prestige. 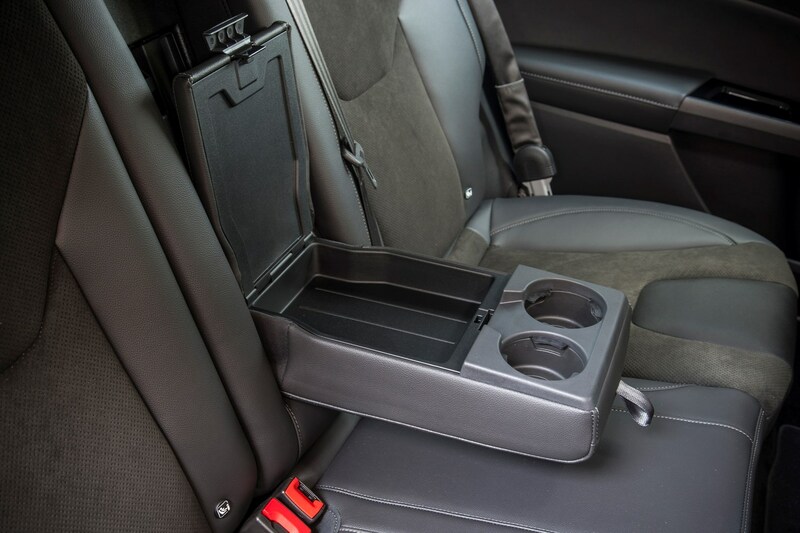 We like the useful storage spot in front of the gearlever though. 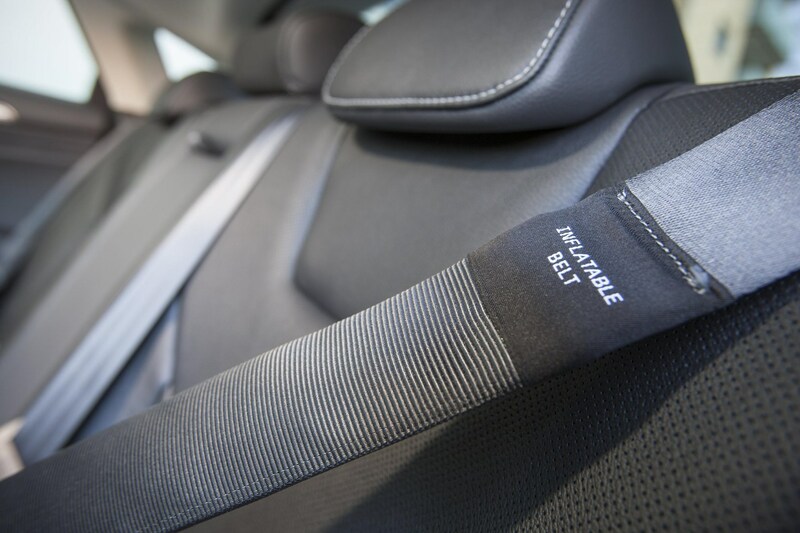 Migrate to the rear bench and if you’ve got your family head on you’ll have added the optional inflatable (airbag) seatbelts seen in our example. 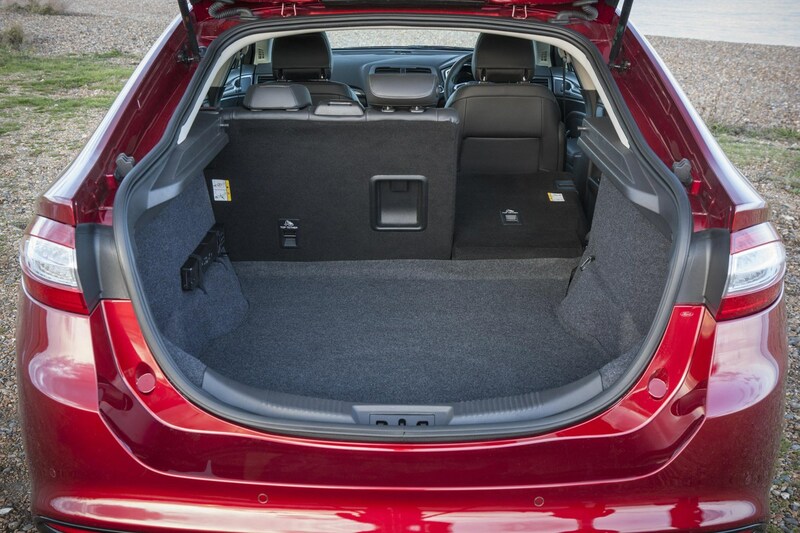 You’ll also notice there’s bags of room, with three adults able to be accommodated relatively comfortably, plus even more space behind. 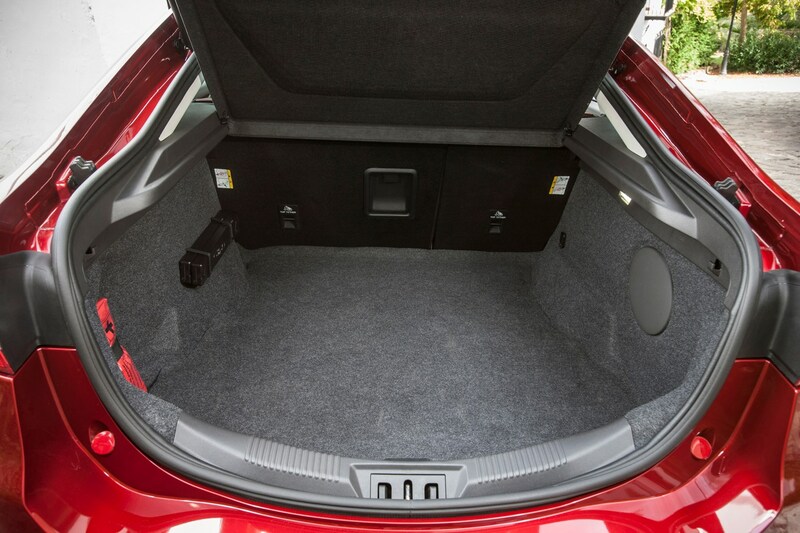 Around 540 litres is available with the seats in place, though dropping them in the 60/40 configuration completely reveals a total of 1,470 litres. 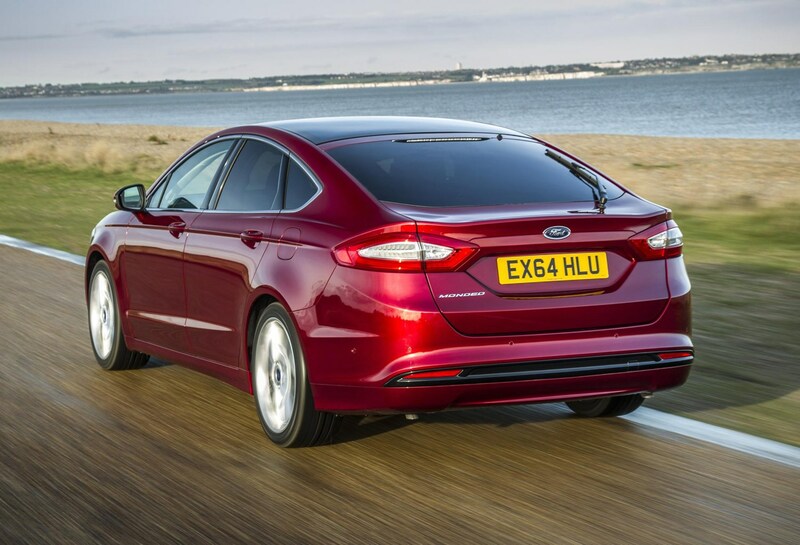 And along with the large cabin there’s a sizable amount of kit included on Zetec models as well, though on first glance this Mondeo might not seem particularly well-specified. 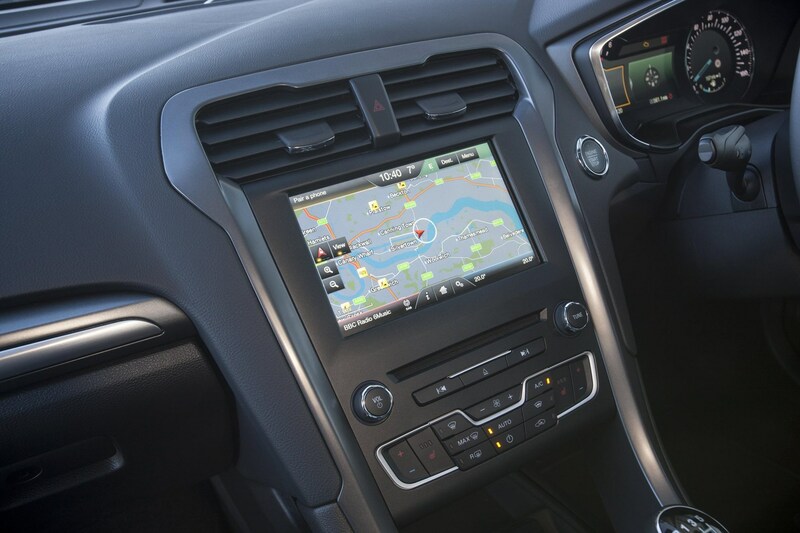 Look closely and there’s cruise control, hill-start assist, tyre pressure monitoring, climate control, Quickclear heated windscreen and a touchscreen multimedia system with DAB digital radio, Bluetooth connectivity and an 8.0-inch colour touchscreen. 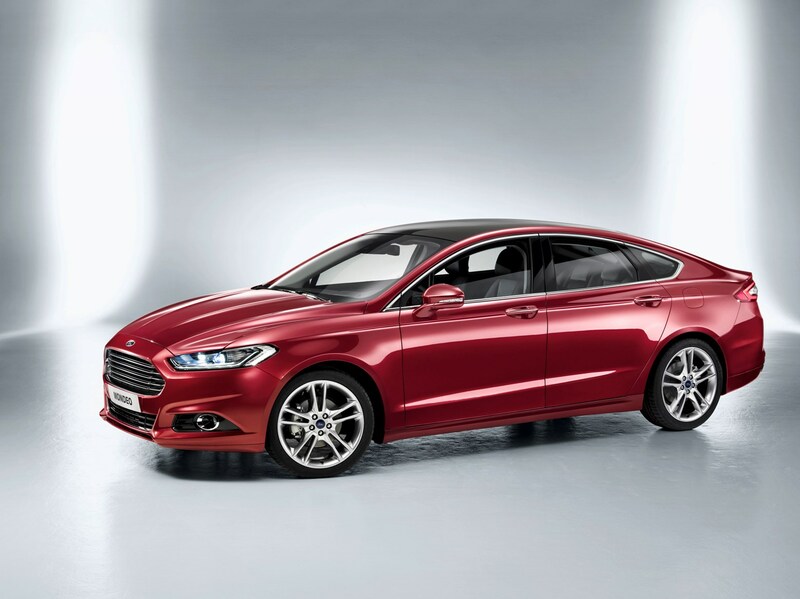 You notice the car’s size, and weight, while on the move though as the 2.0-litre diesel drags the Ford from 0-62mph in around 9.5 seconds. 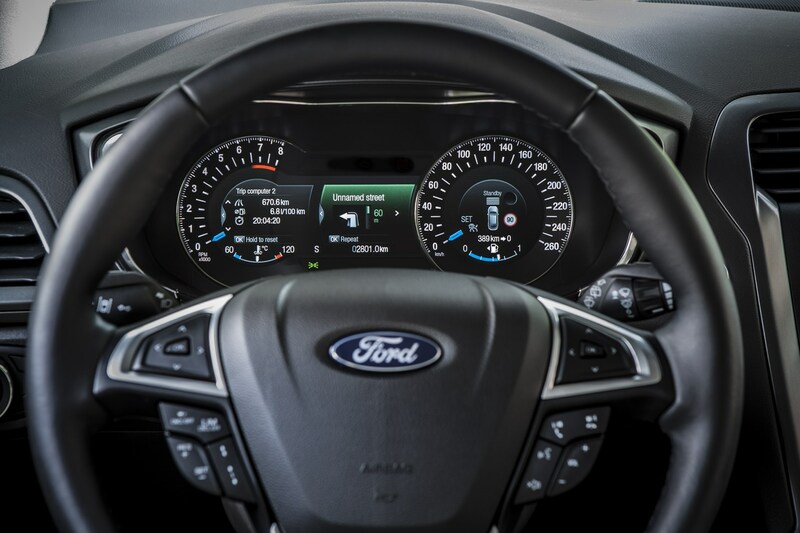 It’s torquey enough, but you’ll need to be north of 2,000rpm to really notice, and the official combined economy is a heady 62.8mpg, even if the reality is likely to be around 5-15mpg less than that. 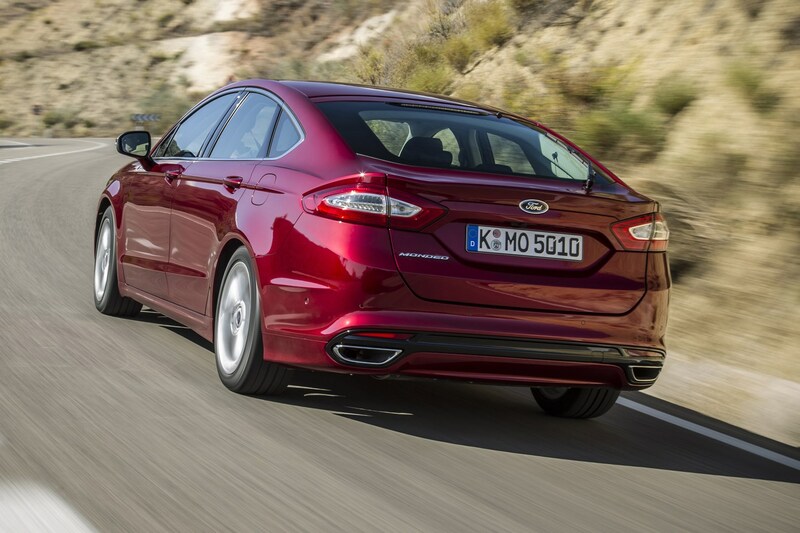 Forgetting about the family for a moment though, the Mondeo is still a car that can be enjoyed by an enthusiastic driver with feelsome steering and exemplary body control. 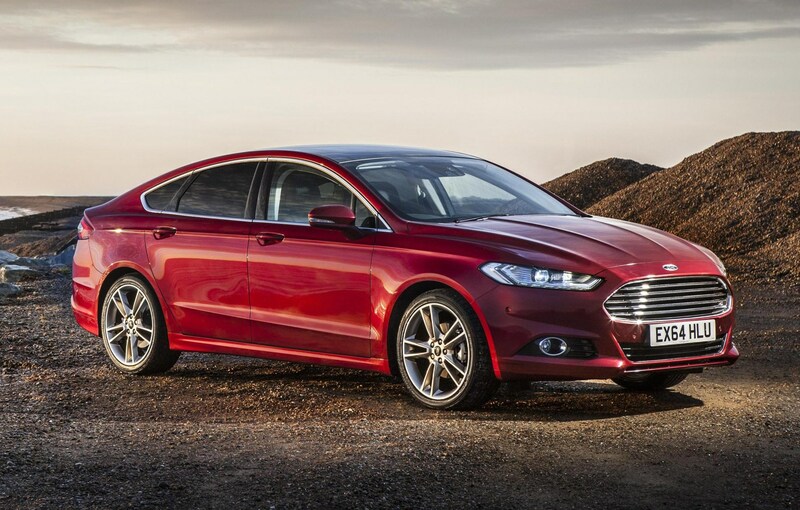 If you’re going to buy a Mondeo, then in our mind it’s either this or the Titanium model that makes the most sense. 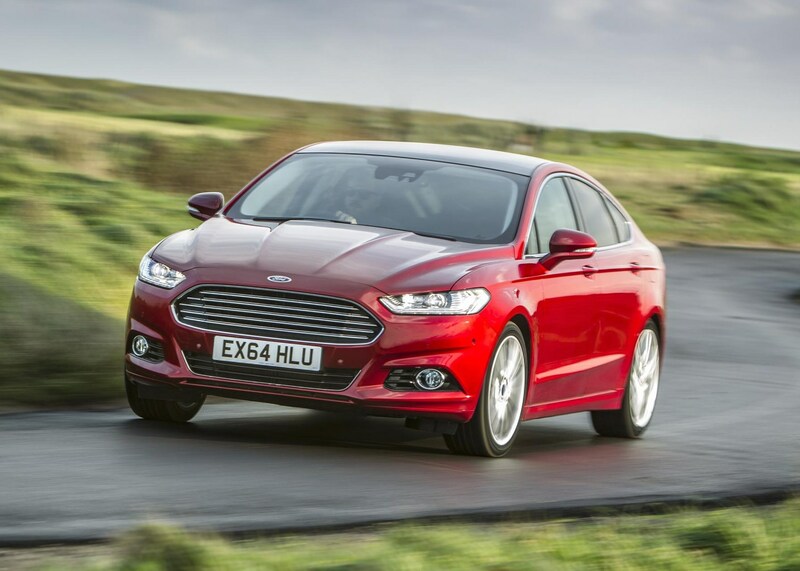 In Zetec trim this Mondeo is amply equipped and promises to be relatively cheap to run. It is, as it appears, an awful lot of car for the money. 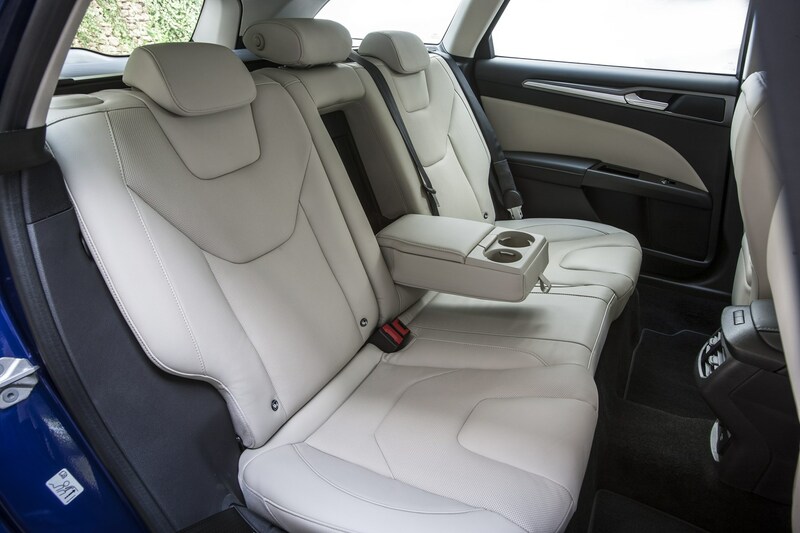 However, be aware the Titanium trim is only around £1,200 more and adds a host of extra kit including sat-nav, lane keep assist and keyless start. 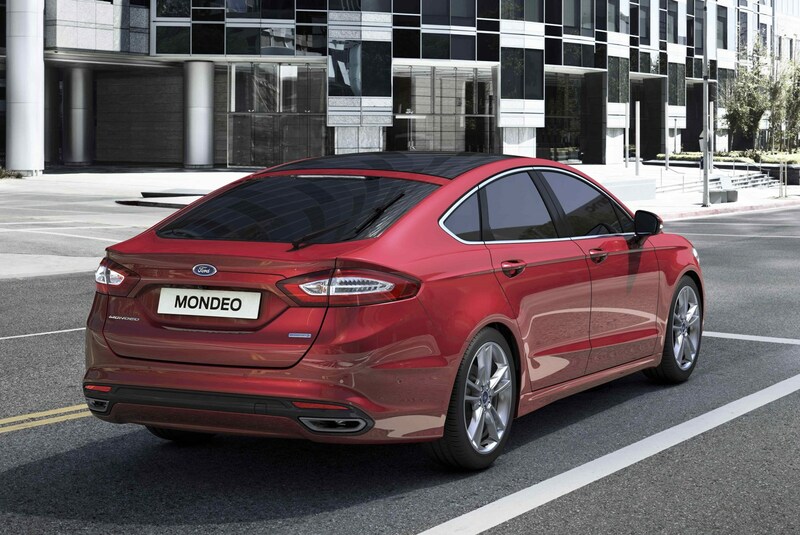 When it comes to importance, few cars harbour such lofty expectations as the new Ford Mondeo. 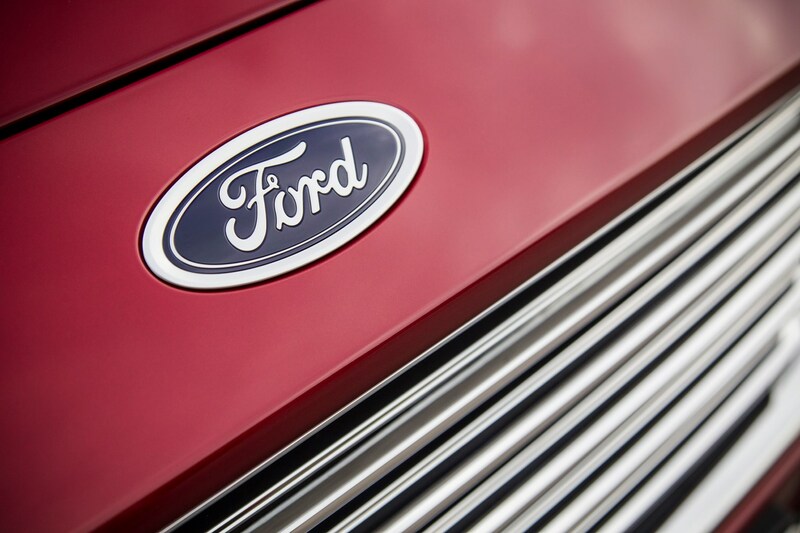 Having sold over 14 million since it introduced the nameplate back in 1993, it’s as familiar on Ford’s profit-and-loss lines as it is in our housing estates, motorways and supermarket car parks. 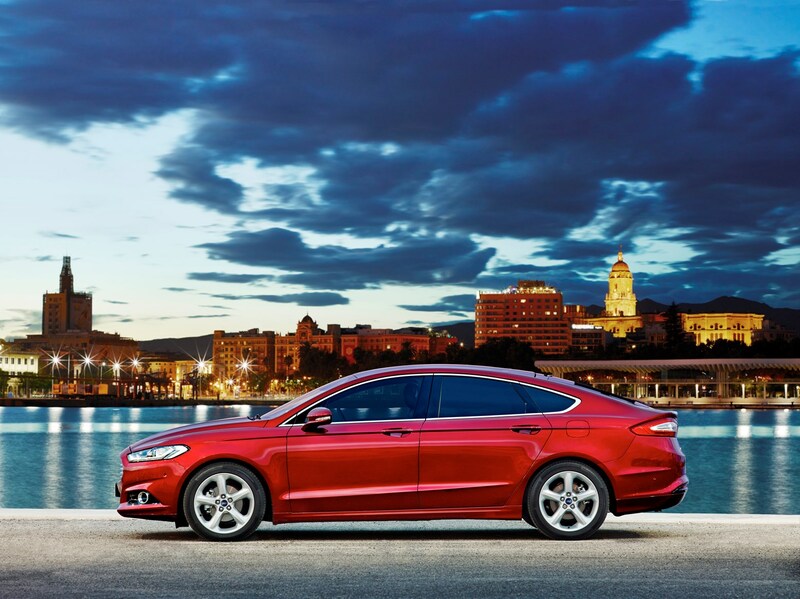 Always a default choice for family buyers looking to pair value-for-money with exceptional driving characteristics, it has a lot to live up to. 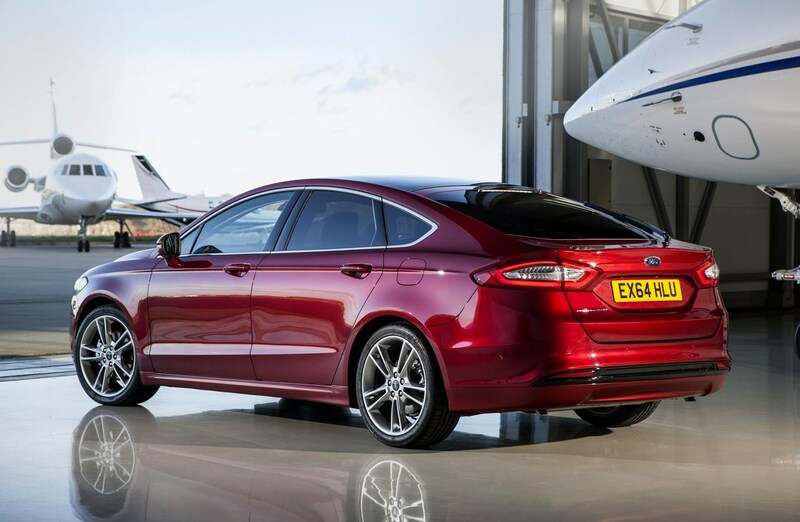 Which might partly explain the gap between the saloon model being sold in America (marketed as the Fusion) and its arrival here in the UK three years after. 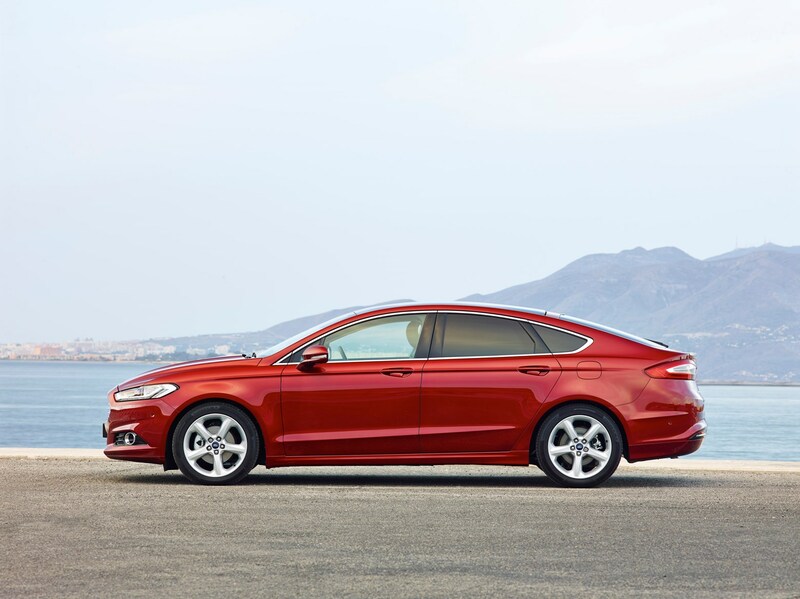 Comprehensive re-tuning of the way it drives, looks (you can’t have the estate or hatchback in the US) and feels inside and out has resulted in the car we see here today. 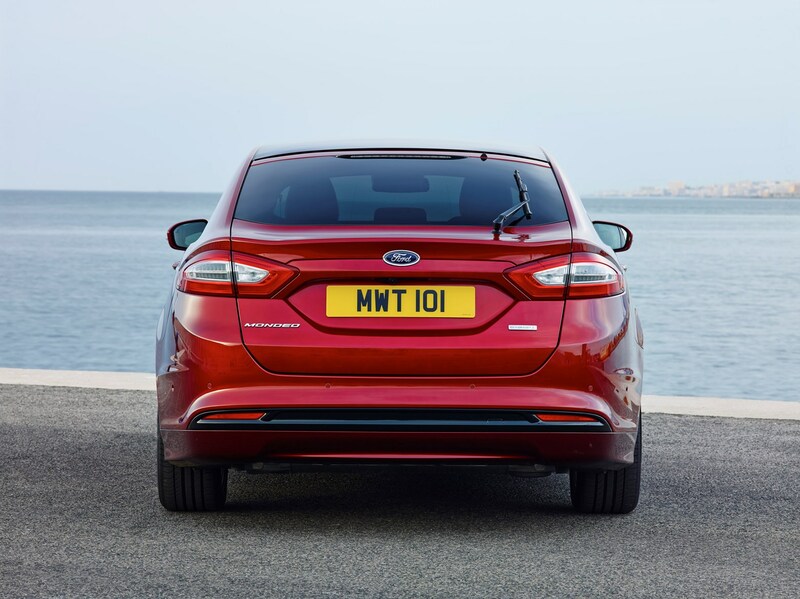 It’s this mid-range 2.0-litre TDCi with 150hp that takes the lion’s share of sales, which in Titanium trim, wearing a hatchback body, starts at a reasonable price new. 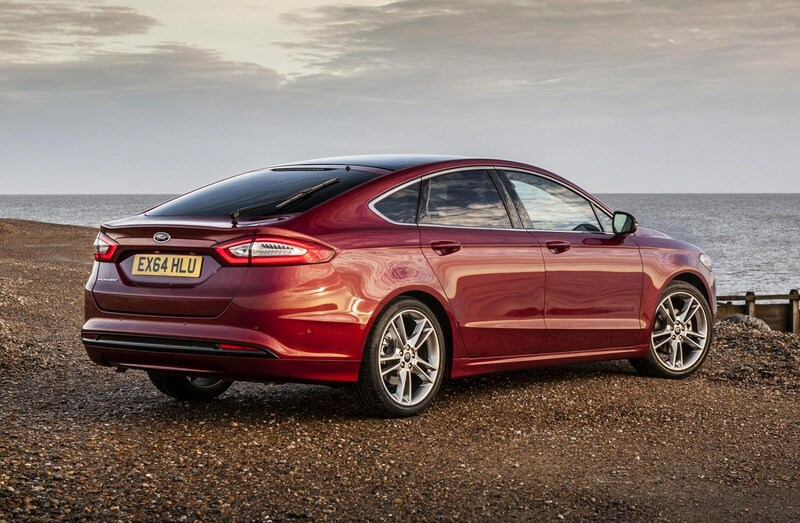 Longer, wider and slightly lower (without any decrease in occupant headroom) the Mondeo immediately looks like a lot of car for the money. 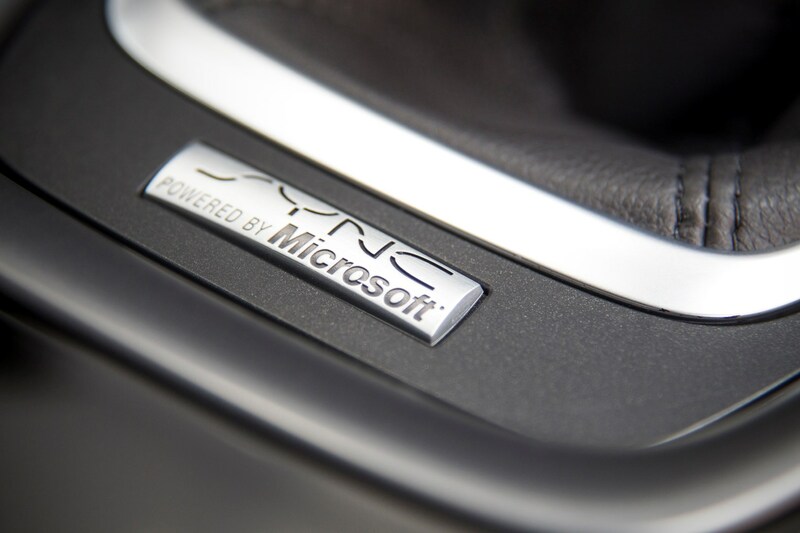 There’s no escaping its size, but it carries its weight well with a design sportier and more aggressive than some of its rather passive competitors. 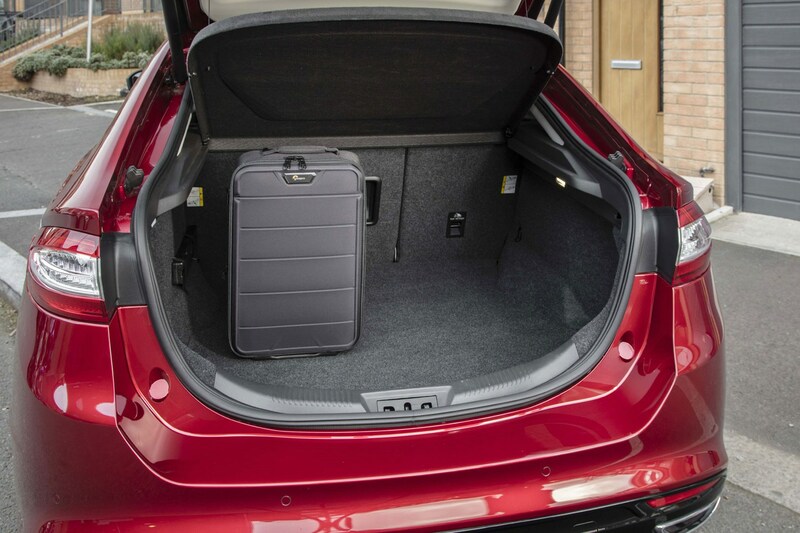 There’s no complaining about interior space either, whether you’re up-front, behind or simply loading the 550-litre boot – accessed by a wide opening. 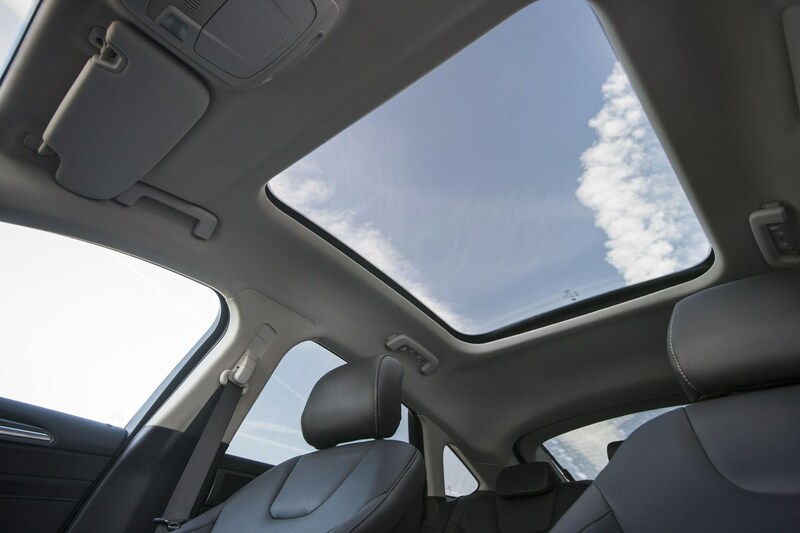 Titanium trim comes loaded with kit too, the exterior featuring 17-inch alloy wheels, automatic high beam headlights and LED taillights. 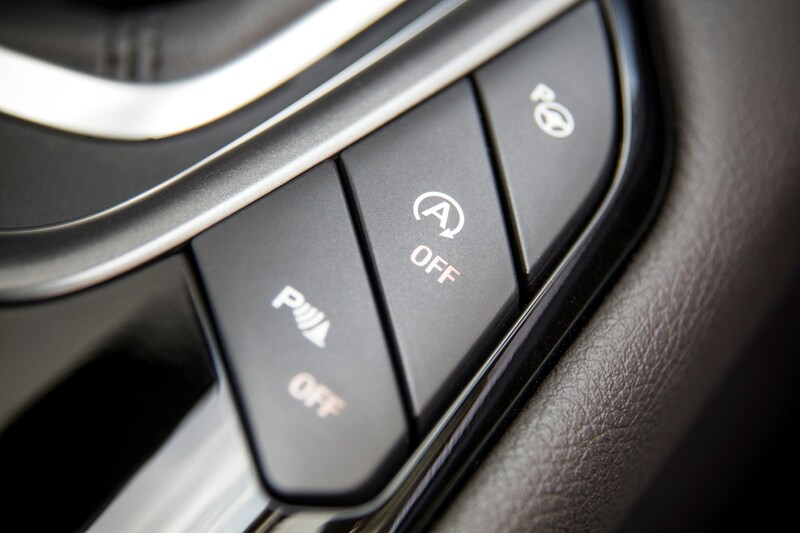 The wipers turn themselves on when it rains, a lane-keeping assistant ensures you don’t stray into other traffic during momentary loss of concentration on the motorway, cruise controls takes the weight off your right ankle and the rear view mirror automatically dims when a vehicle is behind, lights ablaze. 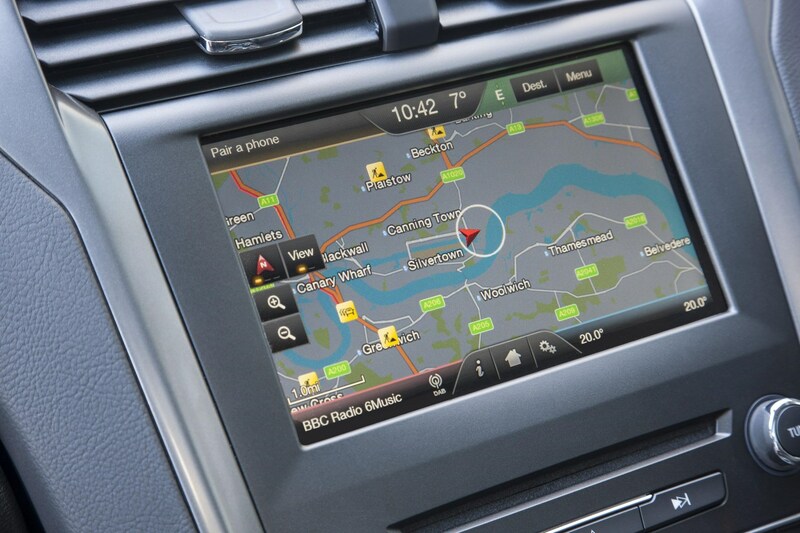 Sports seats mean you remain comfortable and supported on the move, the 8.0-inch colour touchscreen comes with DAB radio and sat-nav, the instruments are an upgraded TFT cluster and there’s a heated windscreen for frosty winter mornings and dual-zone climate control keeps the cabin at your desired temperature. 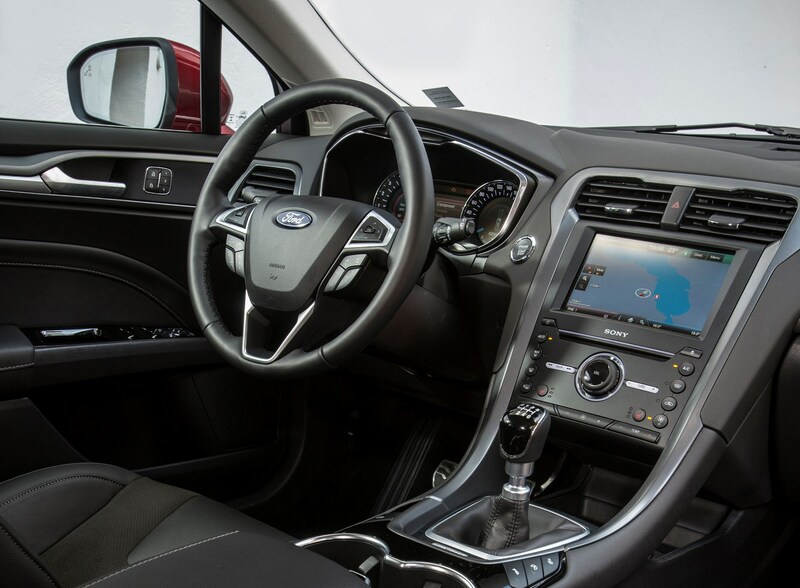 Previously famed for its ability to delight the driver with its responses, little has changed with the new car; the steering isn’t quite as feelsome as before thanks to the new electric assistance but it’s incredibly agile given its heft. 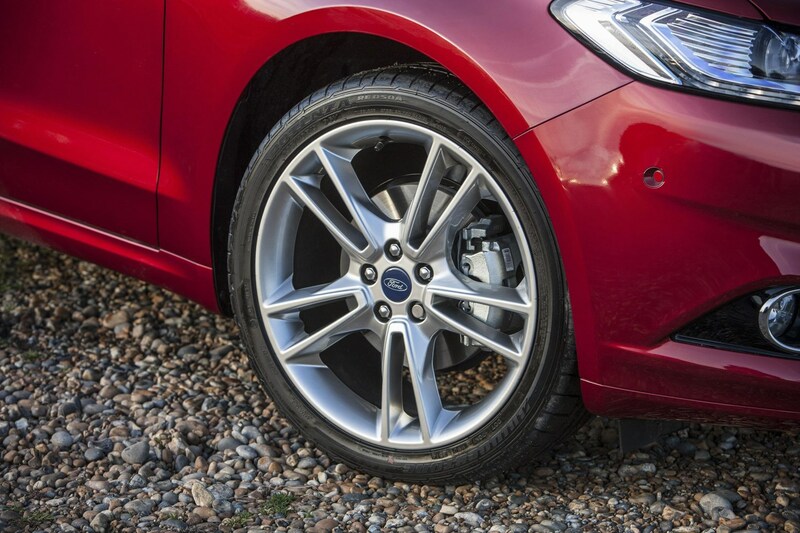 There’s plenty of grip too, and while the 19-inch rims on our car meant it suffered from a slightly firm ride and occasional tyre roar, it’s impressively quiet at speed. 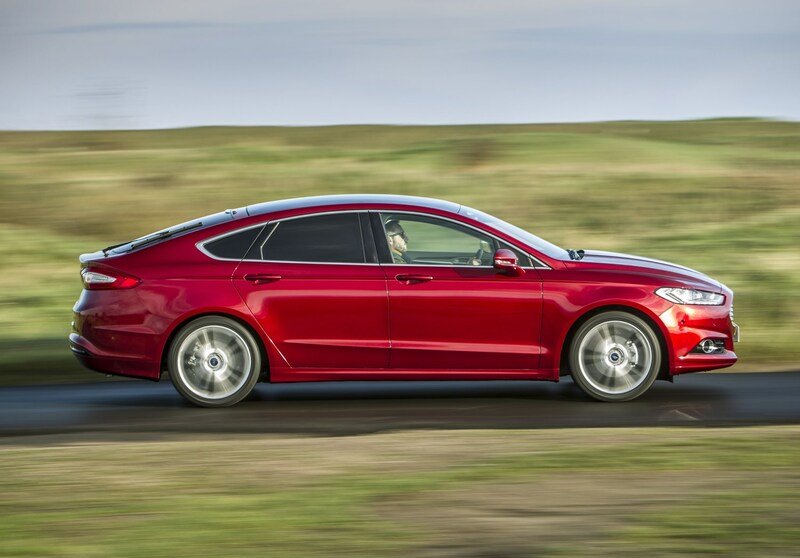 At lower engine speeds there’s not quite the urge found in its main rival, the 2.0-litre TDI VW Passat, but once above 2,000rpm the Ford has plenty of performance on offer. 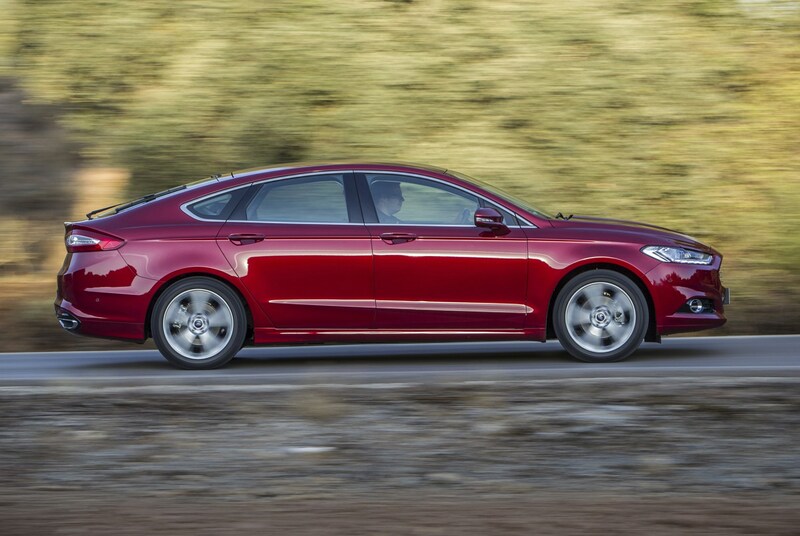 The 0-62mph benchmark takes 9.3 seconds, thanks to 350Nm of torque, and top speed is 134mph. 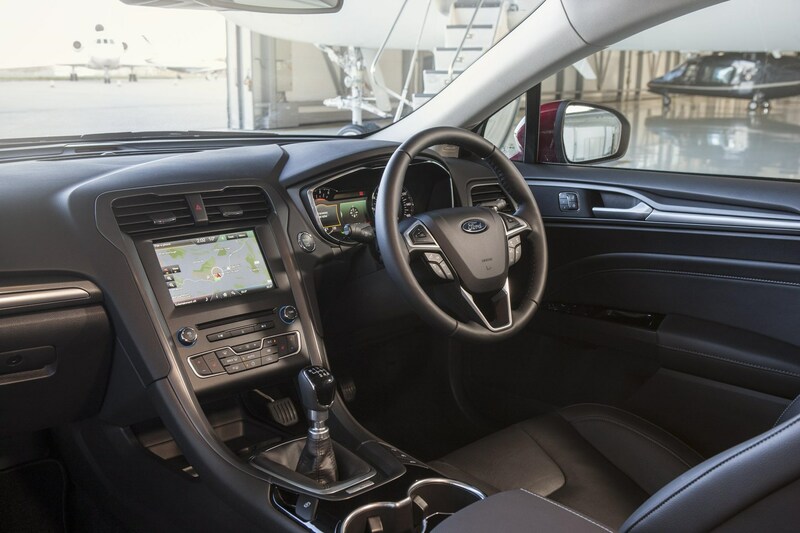 More relevant is this car’s claimed 62.8mpg economy and 117g/km of CO2, ensuring it will remain popular with both fleet and private users. 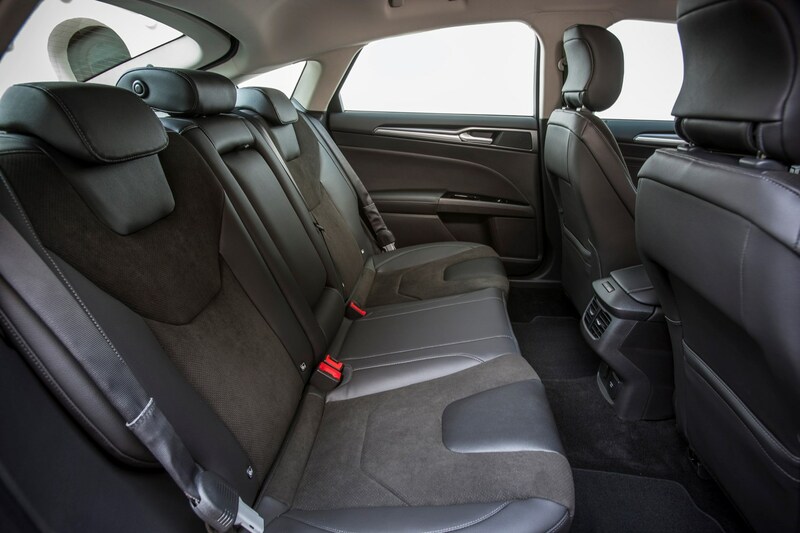 Previously the Mondeo was the default choice in the sector, but now it’s simply a default choice; the VW Passat is better than ever, bridging the previous gap between these cars’ driving abilities while retaining superior cabin fit and finish. 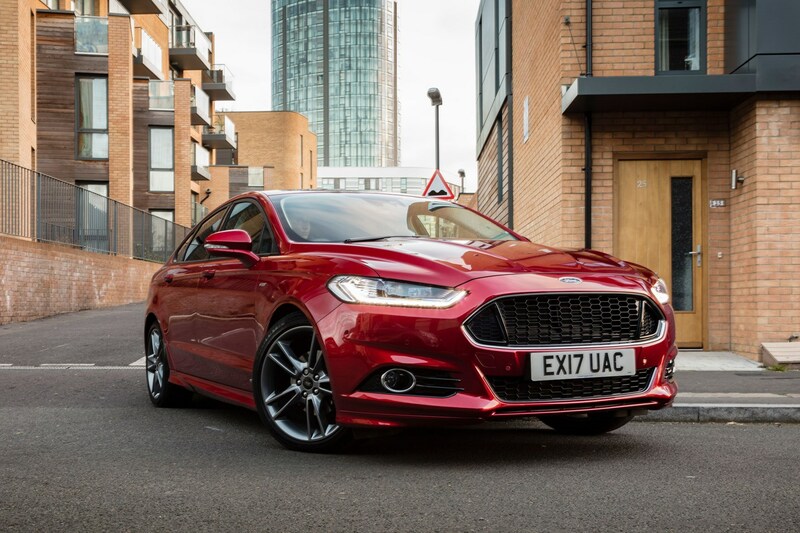 Without doubt the new Ford Mondeo is still a superb car, offering plenty of space, impressive economy, a great driving experience, excellent interior quality and plenty of kit. If you can resist adding the Titanium X pack then at £23,495 it represents a sound choice in this sector, but at nearly £30,000 as tested we’d spend our money elsewhere. 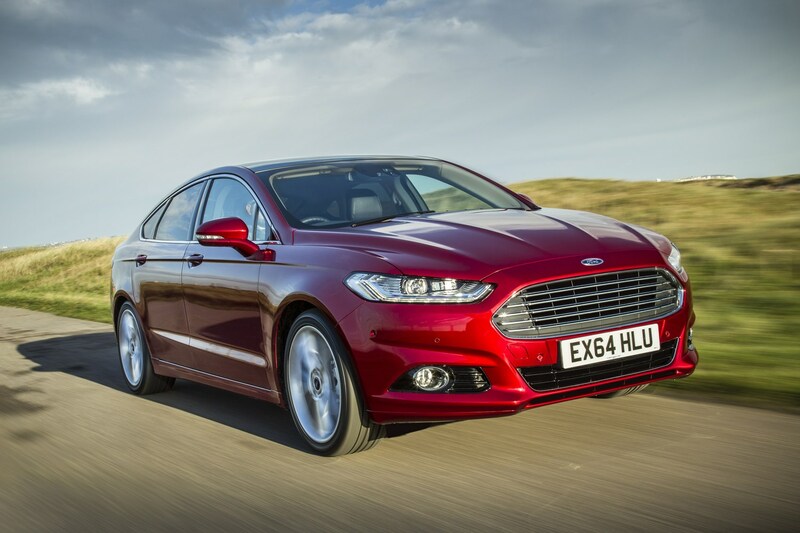 Most Ford Mondeo sales will go to company car drivers, with a much smaller proportion being bought by private buyers. Private buyers should still be able to negotiate a decent discount, but if you’re considering getting a better deal from a broker be conscious that you’ll be buying from stock and consequently any options you desire might be missing from the list. 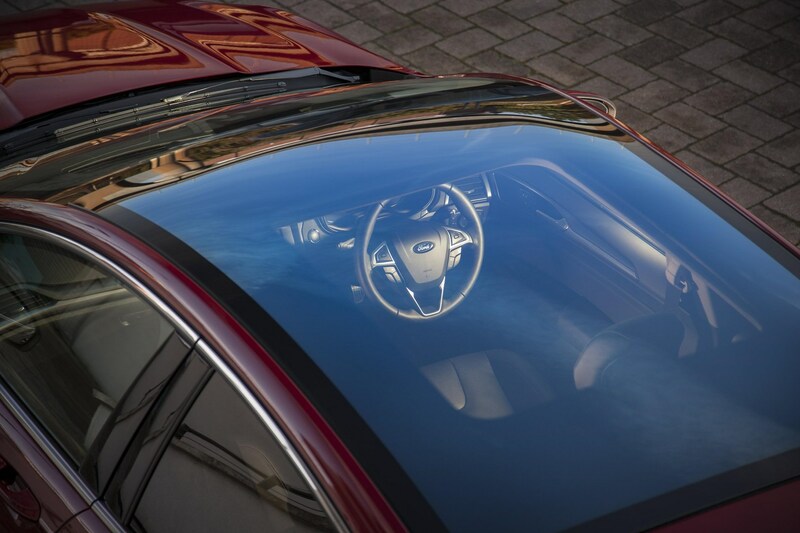 We’d suggest aiming for mid-range Titanium for a well-equipped car, while the similarly-priced ST-Line is better if you want a sportier look rather than a few luxuries. 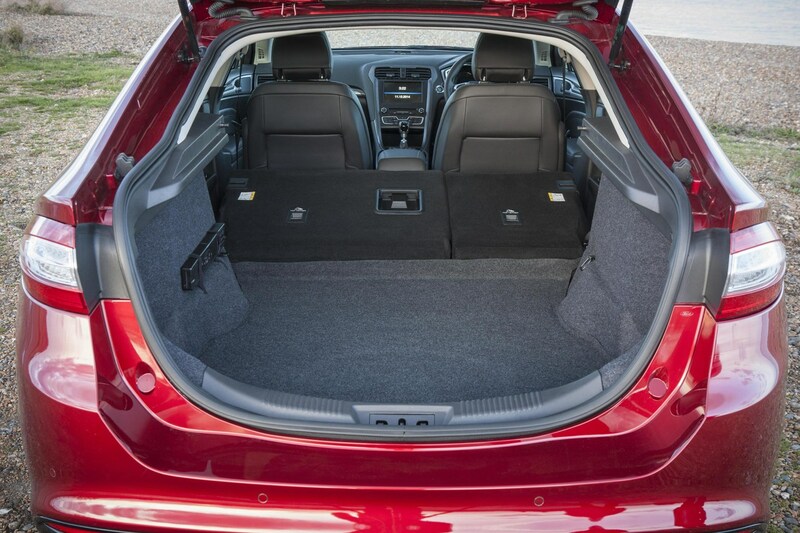 It might still be tempting to add a couple of optional extras, but doing this could become expensive. 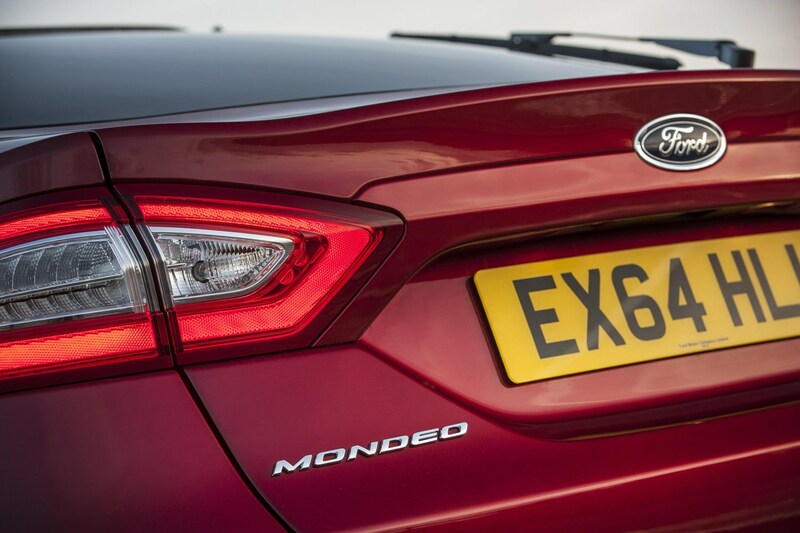 Luckily, there’s nothing you desperately need to add to the Mondeo – what you’ll want to add will come down to personal preference, although we’d suggest the reversing camera at the very least. 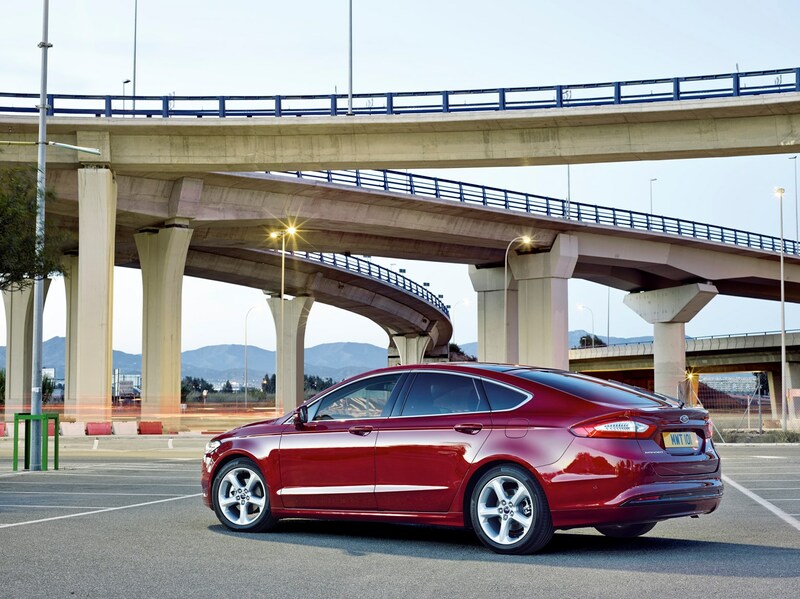 The bulky rear end of the Mondeo can be difficult to judge when backing into a tight parking space. 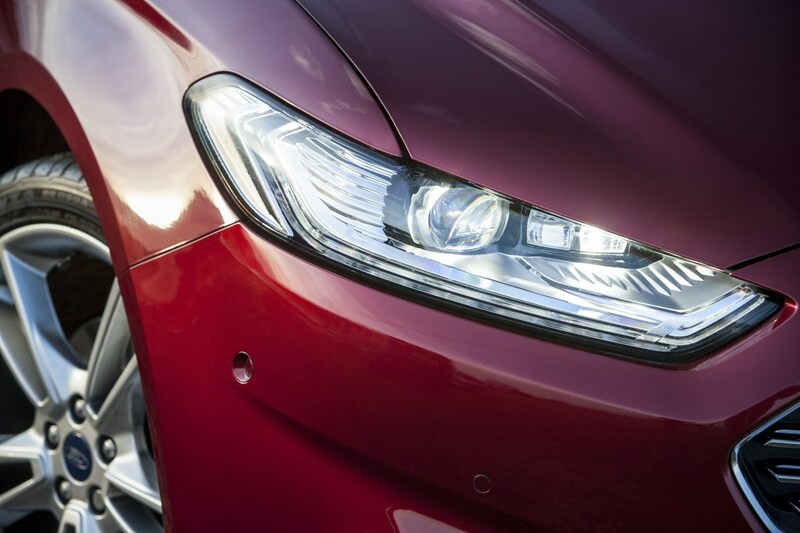 The bright LED headlamps may be worth upgrading to if you spend a lot of time driving at night. 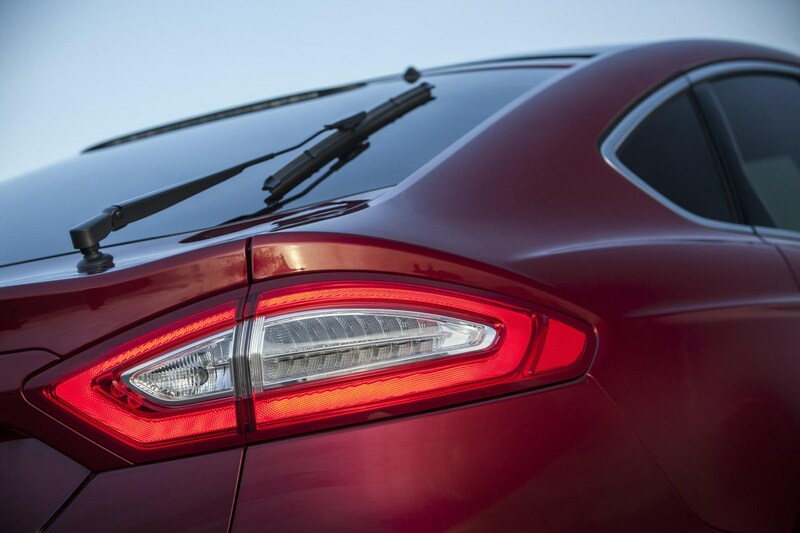 They’re excellent at lighting up the road better than normal halogen bulbs do, plus they’re adaptive so they move with the turn of the steering wheel, and have automatic high-beam, too. 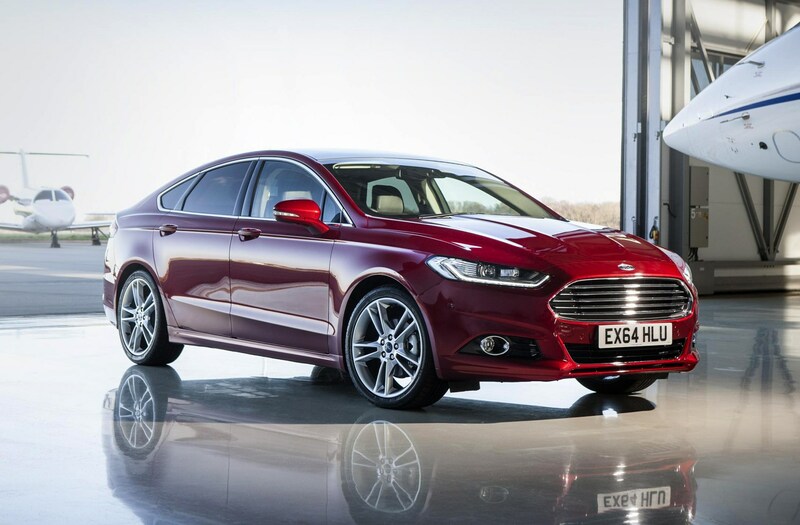 The Mondeo is a common sight on UK roads so finding one in the specification you desire, even with some of the key options and a the engine you prefer (so long as it’s diesel), shouldn’t prove difficult. 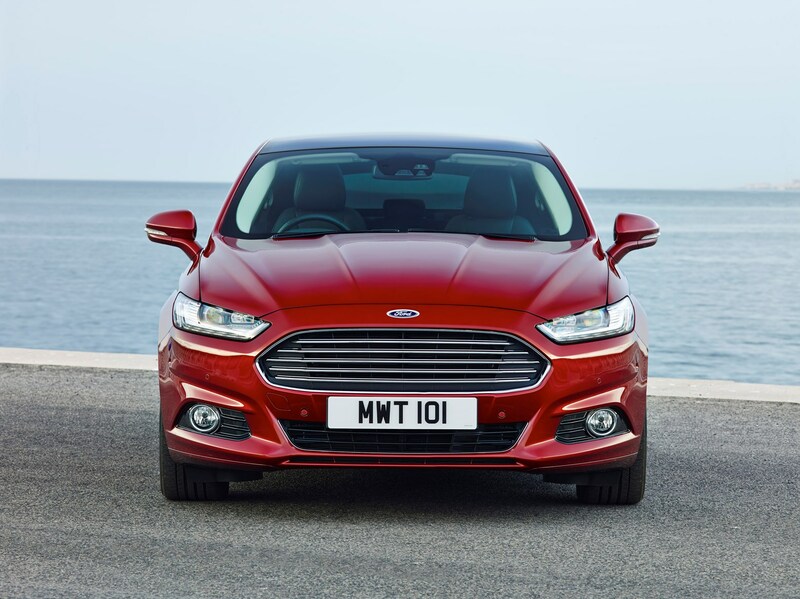 As most will be ex-company cars (as Ford says the majority of Mondeo registrations are), mileages could be higher than you’re expecting but in reality they will have broadly had pampered lives with very regular servicing and good levels of upkeep. 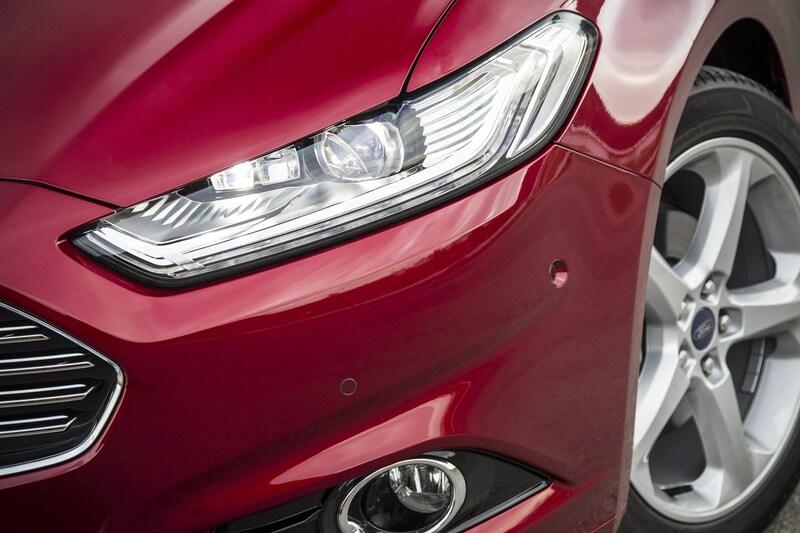 Ensure all the equipment works as it should and that the car’s been looked after. Similarly check all the paperwork tallies up and that it’s been serviced and maintained as it should have been. 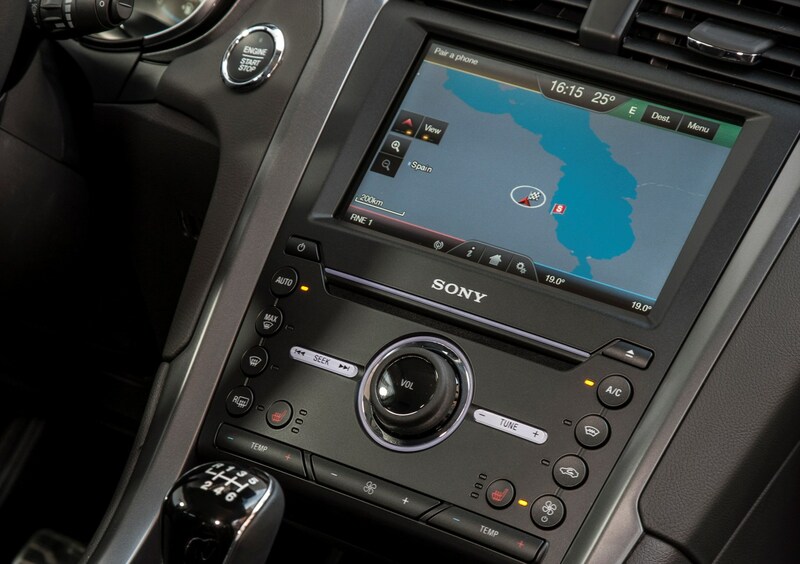 Ease your doubt further with a Parkers Car History Check to discover any secrets such as outstanding finance. 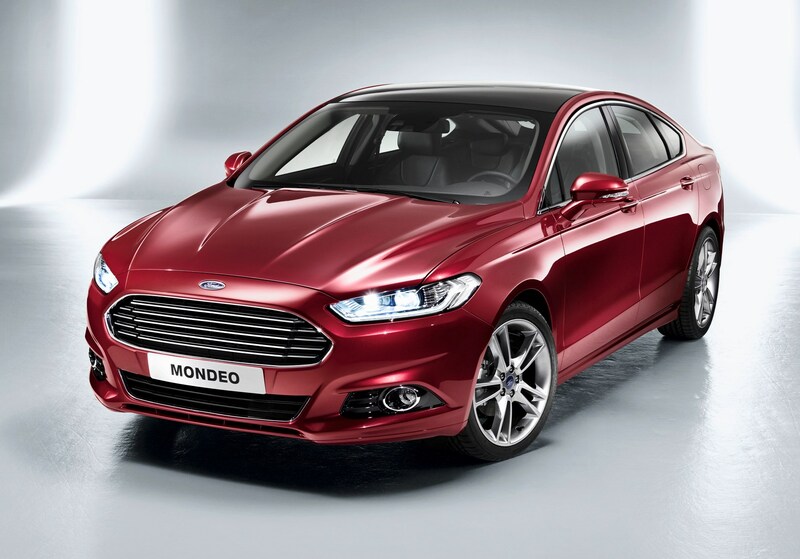 You won’t be the only person looking to sell your Mondeo, so ensure yours is kept in top order to maximise your chances of a quick sale, as buyers will have a significant number of alternatives to choose from. 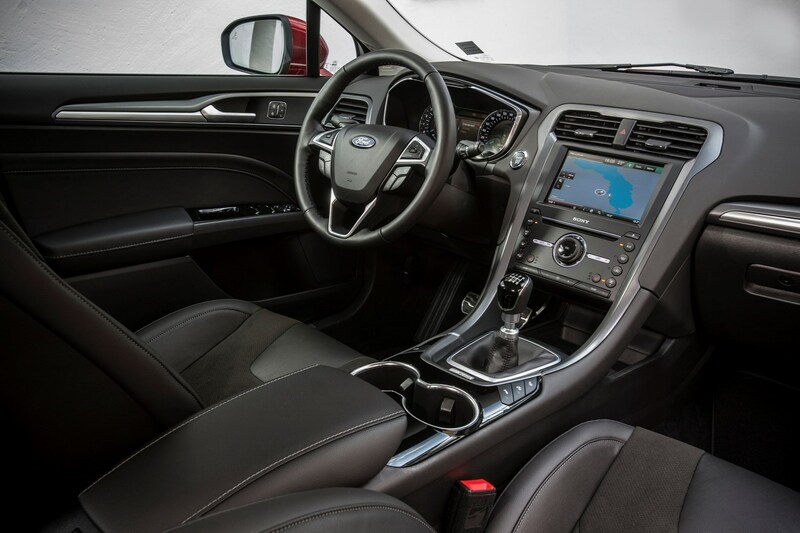 Ensure all the paperwork is complete including a fully documented service history and that any parking scrapes and wheel damage have been repaired or replaced. 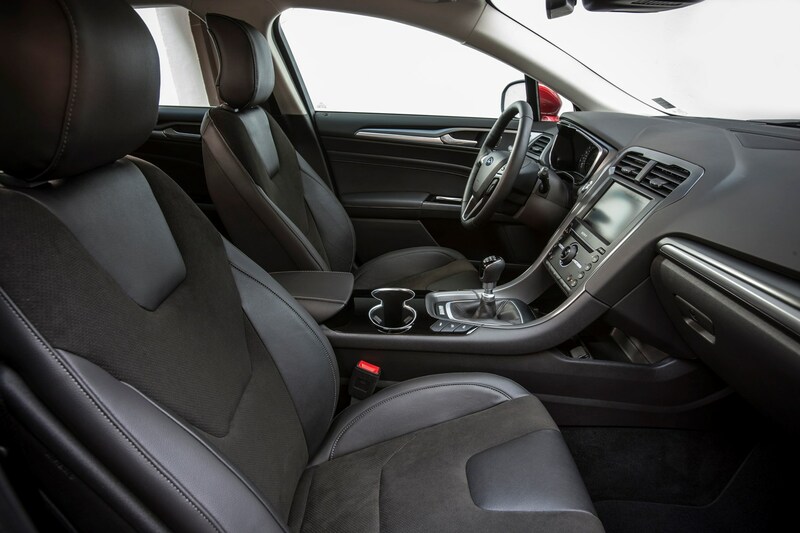 It’s also worth giving the car a thorough valet, removing all barring any essentials from the interior and photographing the car well for the advertisements. Don’t underestimate the importance of a well-written advert either for its potential to attract customers. 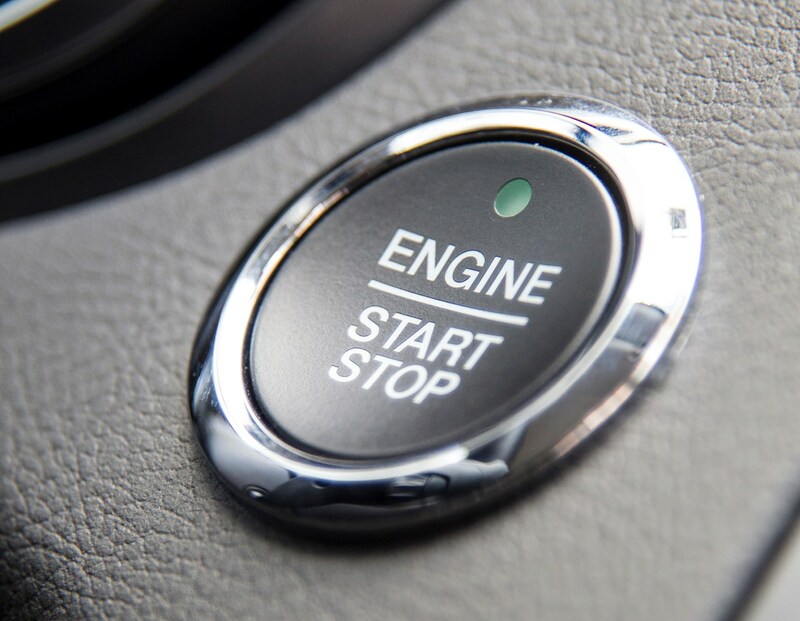 Finally, ensure the car is priced correctly by taking out a Parkers Valuation to save wasting your time or any potential buyers’.